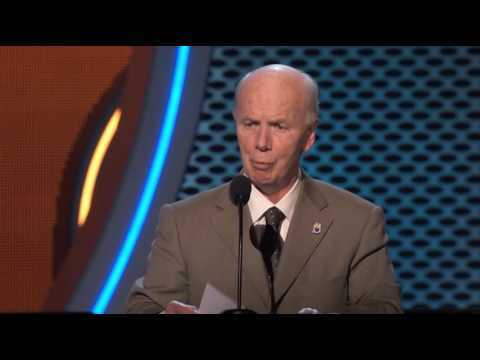 Just days after a train collision tragedy in Panhandle, Texas, which claimed the lives of multiple BNSF employees, BMWED President Fred Simpson and BLET President Dennis Pierce addressed the 29th International Brotherhood of Teamster’s Convention June 30 regarding Rail Safety. Following Presidents Sinmpson and Pierce’s remarks, the delegates of the IBT convention voted unanimously, and with thunderous applause, to pass a Rail Safety resolution. The resolution calls on the delegates of the 2016 IBT Convention to go on record in support of the Rail Conference unions’ efforts to improve railroad safety in areas not limited to; improving standards for track safety, bridge safety, and rail integrity as well as going on record to support a full and timely implementation of Positive Train Control (PTC) and taking action to address the issue of fatigue. “As you know, railroading is one of the oldest occupations in North America … and continues to be one of the most dangerous. In the five years since we last met in Convention, 75 railroad workers were killed on the job and over 21,000 suffered reportable injuries. The toll on our members, their families, and the safety of the public-at-large is incredibly high. That is why the Teamster Rail Conference and its two divisions work closely in the legislative and regulatory arenas to further railroad safety and the safety of our members and the public. Our members are skilled professionals, but our work is dangerous and difficult. Trains run 24 hours a day, 7 days a week. And tracks and bridges are in constant need of inspection and repair, in all types of weather and at every time of day,” President Simpson said. Be It Finally Resolved that the delegates to the 2016 International Brotherhood of Teamsters Convention go on record supporting closer cooperation between the Federal Railroad Administration and the Occupational Safety and Health Administration to address any gaps in regulatory coverage to protect railroad workers from all occupational hazards that exist in the railroad industry. a national radio show based in Madison, Wisconsin, the site of one of the largest civil actions against a state governor, this daily program recently featured Jim Hoffa, Teamsters General President, in an interview discussing the political landscape. The 2016 election season is now in full swing. So it’s only fitting that two federal courts in the last week have weighed in with rulings that could result in more people getting the opportunity to vote come November. It began when a federal judge on July 19 significantly weakened an important provision in Wisconsin’s voter suppression law, saying the public cannot be subjected to an “undue burden” as part of a requirement to vote. Those without state-required ID can now sign an affidavit saying that gathering the necessary documentation to obtain identification would be too burdensome for them. But an even bigger ruling was handed down July 20, when the conservative U.S. Court of Appeals for the Fifth Circuit determined that Texas’ efforts to curb voter participation went too far because it disenfranchised minority voters. The ruling also affects a similar effort in Mississippi since that state falls under the purview of the Fifth Circuit as well. Taken together, the two rulings could allow some 900,000 voters who previously would not have been able to vote to now cast a ballot this fall. But the precedent is even bigger, as the Los Angeles Times noted in a staff editorial. Voter suppression has been on the uptick over the past three years after the U.S. Supreme Court cut the heart out of the 1965 Voters Right Act. It’s lead to the disenfranchisement of millions who have had their rights rolled back because they can’t afford or don’t have the ability to obtain identification now needed to vote. Today, the Department of Labor issued a new rule that updates the regulations determining which white-collar, salaried employees are entitled to the Fair Labor Standards Act’s minimum wage and overtime pay protections. The rule increases the salary threshold below which most white-collar, salaried workers are entitled to overtime from the current $455 per week (or $23,660 for a full-year worker) to $913 per week (or $47,476 for a full-year worker). The updates will impact 4.2 million workers who will either gain new overtime protections or get a raise to the new salary threshold. So who are these workers? More than half − 56 percent − are women, which translates into 2.4 million women either gaining overtime protections or getting a raise to the new threshold as a result of the rule. We also find that more than half – 53 percent − of affected workers have at least a four-year college degree, and more than 3 in 5 (61 percent) are age 35 or older. And 1.5 million are parents of children under 18, which translates into 2.5 million children seeing at least one parent gain overtime protections or get a raise to the new threshold. To get a deeper understanding, it’s also helpful to look at the group that affected workers come from – those currently exempt from overtime (that is, white-collar workers who were not entitled to overtime pay before this rule change). Workers currently exempt are those who are paid on a salary basis, earn at least $455 per week, and are employed in a bona fide executive, administrative or professional capacity (definitions of these categories used in the regulation can be found here). The first column in the table below shows the demographic breakdown of white-collar, salaried workers who are currently exempt from overtime protections. *Excludes exempt workers who are not potentially affected by the rule because, for example, they are eligible for another overtime exemption. **Includes Native Americans, Alaska Natives, Native Hawaiians and Pacific Islanders, and those who report more than one race. The next two columns show the number and share, respectively, of workers currently exempt from overtime who earn below the new salary threshold. These are the currently exempt white-collar workers at the low end of the pay scale who will gain new overtime protections or get a raise to the new salary threshold when the rule is implemented. We find that currently exempt women are more likely to earn low salaries than their male counterparts, which means that a higher share of them are affected by the rule; more than a quarter (26 percent) of currently exempt women will be affected, compared to just 14 percent for men. Other groups where a high share of currently exempt workers gain overtime protections or get a raise to the new threshold are workers without a college degree (30 percent), workers under age 35 (29 percent), Hispanics (28 percent), and black non-Hispanics (28 percent). While the data show that some groups are more affected by the rule than others, they also show that workers who will benefit from the rule can be found across the board. This long-awaited update means that millions of workers from all walks of life will either gain new overtime protections or see a raise to the new salary threshold. Fact sheets and other materials to help employers and workers understand how the rule will affect them and the broader economy are available dol.gov/overtime. Heidi Shierholz is the department’s chief economist. ¿Quiénes Se Benefician de la Nueva Norma de Sobretiempo? El Departamento de Trabajo de EE.UU. ha emitido hoy una nueva norma que actualiza las regulaciones que determinan qué trabajadores asalariados profesionales tienen derecho a las protecciones de la Ley de Normas Razonables de Trabajo relativas a salario mínimo y sobretiempo. La nueva norma incrementa el umbral salarial bajo el que la mayoría de los profesionales asalariados cualificarán para sobretiempo, de $455 por semana en la actualidad (o $23,660 por año) a $913 por semana (o $47,476). Estos cambios impactarán a 4,2 millones de trabajadores que, o bien ganarán nuevas protecciones de sobretiempo, o bien verán aumentados sus salarios hasta el nuevo umbral salarial. Pero ¿quiénes son estos trabajadores? Más de la mitad -el 56 por ciento- son mujeres lo que se traduce en que, como resultado de la norma, 2,4 millones de mujeres ganarán protecciones por sobretiempo o verán incrementarse sus salarios hasta el nuevo umbral. También nos encontramos que más de la mitad –el 53 por ciento- de estos trabajadores tienen al menos un título universitario de cuatro años, y más de tres de cada cinco (o el 61 por ciento) tienen 35 años o más. Y 1,5 millones son padres de menores de 18 años, lo que implica que más de 2,5 millones de niños verán que al menos uno de sus padres ganará protecciones por sobretiempo o experimentará un aumento de sueldo hasta el nuevo umbral. Para entender esto de una manera más profunda también ayuda que observemos al grupo de trabajadores a los que la nueva norma refiere, o sea, los que en la actualidad no cualifican para sobretiempo. Se trata de todos los trabajadores profesionales que no eran elegibles a recibir paga por horas extra antes de que cambiara la norma. Los trabajadores actualmente exentos son aquellos que reciben su paga en base a un salario fijo, ganan por lo menos $455 a la semana, y están empleados verdaderamente en capacidades ejecutivas, administrativas o profesionales. (Las definiciones de estas categorías usadas en la norma se pueden consultar aquí). La primera columna muestra el desglose demográfico de trabajadores de ‘cuello blanco’ asalariados que en la actualidad son exentos a las protecciones de sobretiempo. Las siguientes dos columnas muestran el número y desglose, respectivamente, de trabajadores actualmente exentos de sobretiempo que ganan menos que el nuevo umbral salarial. Se trata de los trabajadores de ‘cuello blanco’ asalariados situados en el punto más bajo de la escala salarial, que ganarán las nuevas protecciones por sobretiempo o recibirán un aumento salarial hasta el nivel establecido en base al nuevo umbral cuando la norma sea implementada. Encontramos que las mujeres actualmente exentas son más propensas a ganar salarios más bajos que sus homólogos masculinos. Esto significa que la regla aplicará a este grupo en una proporción mayor: abarcará a más de un cuarto (26 por ciento) de las mujeres actualmente exentas en comparación con el 14 por ciento de hombres. Otros grupos en los que un alto porcentaje de trabajadores que actualmente están exentos a cualificar por las protecciones de horas extras o a conseguir un aumento de sueldo al nuevo umbral son trabajadores sin un título universitario (30 por ciento), trabajadores menores de 35 años (29 por ciento), Hispanos (28 por ciento), y Afroamericanos no Hispanos (28 por ciento). Si bien los datos muestran que la regla alcanza a algunos grupos más que a otros, también revelan que los beneficiarios por la nueva norma incluyen a trabajadores de todo el espectro. Esta norma altamente esperada significa que millones de trabajadores de todos los ámbitos ganarán protecciones por sobretiempo o verán incrementarse sus salarios hasta el nuevo umbral. Hojas informativas y otros materiales para asistir a que empleadores y trabajadores comprendan cómo les alcanzará la regla están disponibles en www.dol.gov/overtime. Heidi Shierholz es la economista jefe del departamento. Siga el departamento a Twitter @USDOL_Latino y Facebook @USDOLLatino. I have been alerting the Department of Labor for the past two years regarding my situation. For over two years, I worked for a company, most weeks having to work up to 70 hours per week. My calculations put my salary below minimum wage. Some of the work I did was to benefit the local Democratic Party. My complaints to Charlie Crist, who was running for governor at the time, ended up in my losing my job. It has been a year since I have been struggling to make ends meet with part-time jobs. When I complained to the Florida Dept. of Labor, saying that I was working below minimum wage when you factor the number of hours that I was working without pay, I was told by a DOL official that graphic designers are exempt from the minimum wage laws. Can I now make a new claim with the U.S. Department of Labor, now that the standards have changed? Has the president given consideration to the rule that the minimum wage laws do not apply to graphic designers? My suggestion George is that if you don’t want to work “70 hours per week” than quit your job. If you want work only 40 hours, find a job that allows that. If you want to work less, then find a job that provides that for you. If you want to make more money per hour then find a job that pays that. If you need more training or education for more pay, then do that on your own time. The bigger and more important question is, why are you asking Charlie Crist, the DOL, or the President for more money or a better way of life? Please get help… but not through the government. You can do this on your own and I believe in you that you can. Your response is VERY inconsiderate of the situation. Clearly, George NEEDS to work to live and can’t quit the job. When he complained, he was fired! He was not able to find another full time position. We don’t get too many choices in this economy. Re-think your response. I’m curious if you ever considered finding employment elsewhere. Before I started my own company, if an employer was unfair or dishonest, I found work elsewhere. Now that I have my own small business, I try to be as fair and generous as possible, while still keeping the company afloat. Raising the minimum wage will result in us not hiring students on school breaks, or hiring unskilled individuals and giving them the necessary ‘free’ training to allow them to grow in their careers. The new overtime law will make it necessary to drop the wages of our salaried managers and eliminate their bonuses to adjust for uncertain overtime costs. It will also cause them to lose pay when they leave for portions of the day for personal reasons. There are many more good, honest caring companies than there are bad ones. The bad ones have teams of lawyers and lobbyists to prevent them from being negatively affected by these types of laws. The rest of us can’t afford to maneuver through the loopholes, so our people end up paying the price. Thank you. Everyone asks why I didn’t look for another job. The answer is that I tried — constantly. It may be that it’s harder to find work once you’re over 55, I don’t know. But I am now working 3 part-time jobs not related to my career. I am not making enough money to pay my bills and have had to declare bankruptcy. I cannot afford insurance, and thanks to Gov. Rick Scott, cannot take advantage of the Medicaid expansion. The company I originally worked for that refused to pay me a fair wage for my hours could have afforded to pay me extra — I know that for a fact. What amazes me in these online discussions is how many people are willing to make excuses for these companies that take advantage of their workers. The Department has grossly overstated the benefit of the new regulation, particularly in comparison to the negative impacts on both employers and employees. Their estimates of how much employees will benefit assumes that newly eligible employees will either get a higher salary or earn the OT premium. The other option is that these employees will be converted to hourly wage earners and not earn OT compensation, and may in fact lose income through more tightly managed hours. The DOL has blithely asserted that such an outcome will benefit employees by giving them more free time, but such an outcome will certainly not be consistent with the administration’s rhetoric about this regulation putting more money in people’s pockets. Furthermore, these new hourly employees will lose workplace flexibility options as well as the use of electronic or remote access because all that time must be captured and compensated. Agree Marc! Well said. Unfortunately most will not put your logical insights into perspective. I agree with Marc. We will probably see an increase in full time jobs being eliminated and replaced with 2 part time jobs for larger companies. Small businesses and small start-up that are already struggling will be put out of business. I thought the whole idea about salaried workers vs. hourly workers is the overtime issue. As a small women-owned business, i can barely cover my own healthcare cost (which is $500/month with $4,500 deductible since i’m not eligible for Obamacare). i’m trying to grow my business which requires overnight travel, meeting with customers, etc which means i cannot financially afford to hire ANY employees because the overtime rules would put me out of business. Thank the government AGAIN for just another reason that companies outsource overseas employees. If you can’t afford to pay overtime, then don’t ask workers to work over. It’s your business and life, not your employees. You are building the business for your family, not their’s. Funny how it’s her business and her life yet the workers need her and business for a paycheck. Maybe those overtime hours allow her small business to expand permanently, hire more workers to cover the hours and pay her tenured employees more. This law is very short sighted. I have a question on how this new rule will effect clerical/office workers in a business designated as a farm or agriculture. currently, these people have been told they are not able to collect overtime. Will this new rule update that rule to include these people? and how will this also effect the others classified as farm labor? will they be able to now collect overtime for their work? This regulation will hurt workers. To pretend otherwise is insulting. No it does not apply to Puerto Rico. The law is not new…what is new is the limits for its application which have not been adjusted in 25 years. That is going from around $21,000 per year to $47,250 per year. As to hourly workers, they are subject to overtime pay for all hours over 40 per week. So if an employee is putting in 70 hours per week and his salary is $40,000 per year, then he/she will start to earn $28.85 per hour for every hour over 40 hours per week. The employer may cut back the employee’s hours to avoid the overtime pay, but then they must hire someone to work the additional 30 hours in order to maintain the same output. In this example, the employee would receive an additional $21,637.50 if they worked 25 weeks at 70 hours per week. The solution may not be to cut overtime out and hire more folks to do the work, but to give the employee a raise of say $10,000 per year and avoid the problem altogether! From time to time, wages have to be adjusted to keep up with the cost of living. Businesses have simply not been doing that for it employees. Many have been giving their executives massive bonuses for this increase in productivity created by the American worker. Executive salaries have gone from 10 times the average wage rank and file employee’s annual earnings to 3,000 times their average annual earnings. Yet they have not been paying for the services they are receiving – paying for 40 hours and receiving 65 hours in services. This is an attempt to compensate folks for their actual work. Well said Martha. Totally agree. I’m salary, but my job pays overtime. It helps bc they benefit from the under staffed overworked employees and we should be paid for it. Martha, the employer is not going to pay $19.24/hr to the employee ($28.85 at time and a half), they are going to start the employee at $10/hour and pay $15 for OT. The employees earnings will still result in around $40,000 or earnings for the year. So with this new rule ,if my company gives me a raise does that mean they can still demand I work over 40 hrs a week. Yes, if the company pays an employee over the threshold then the can be kept at their current schedules. A company is most likely not paying anyone that is on salary less than 28k to 30k anyway. Which mean an increase in pay for them would be 19k to 17k. Typically you see employees being paid less than 40k not required to work past 40 hours. It’s the level at 40k to 45k simply due to their new found skill sets and eagerness to move up in the company. But the key factor here is “Overtime” now if you have people on salary under the threshold but they are only required to work over 40 hours and are routinely working 40 hours a week then no need to do anything. Puerto Rico will benefit from this new rule??? Mr. Freedman, What workplace flexibility do you speak of? Comp time ? which is illegal, Flex-time? which has to be used in the same week/pay period or lost. If one works 70 hour in a week then were is the “workplace flexibility options”? weak argument man, perhaps what you say is “grossly Overstated”. . I work for a large retail chain as a manager. When I was offered the position and told about salary and white collar “exemption” it didn’t sound so bad. Sometimes I would have to work more hours without pay, at peak times, holidays, but it wouldn’t be unreasonable. Holiday week? You’re scheduled 6 days. No biggie, it’s a holiday right? Also, I was told that it would be mandatory that I was scheduled 50 hours a week, no specific reason, just because. So, ok I work 10 hours a day now. Well thats a lot of responsibility as the manager, and I’m getting a substantial raise, so ok. Problem is, I have to cover all call ins, perform all my manager duties, and perform basic worker duties because the company won’t allow us to hire more than the budgeted wages allotted for us, regardless of if it was an arbitrary number based on projections. Didn’t matter if the demand was clearly there. I’m scheduled to work 7 days, 80 hours on memorial day week. I’m being paid for 40. This doesn’t count the inevitable call ins I will have to cover. I can’t just quit because the middle class, lower middle class job place has been turned into a part time only atmosphere. I have to just take the punishment to keep a livable job. This is why this change was needed. I’m not even close to some of the other horror stories people are having to endure, and I’m being paid probably a lot more than some of these poor fast food managers working way more unpaid hours than me. Don’t give me that “well they should have went to college” trash. They shouldn’t be getting abused by incompetent employers who have built their businesses around “white collar exemption” It was never intended for the people it is being used the most on. It wasn’t intended to be relied on, it was intended for every now and then, Bob needs to come in on Saturday to finish that big report, or stay a few hours late to go over the new program with the boss. Not unload the trucks, and work doubles all the time because the company refuses to fire repeat offenders for calling in all the time. I’m happy all these companies are going to get whats coming to them. They’re going to pay for their knee jerk reactions to turn their companies into 5% full time, 95% part time because of the ACA, and then further relying on white collar exemption to hit their unrealistic budgets. If I have to switch to hourly, and have my hours cut sometimes, then so be it, thats reasonable that a company would have to do that sometimes. Whats not reasonable is consistently forcing myself and other workers to work dramatically more than 40 hours and pay them for only 40 hours. I can’t help but think all the people that are upset about this are the very same employers who know they’ve been abusing some of their workers white collar “exemption”. Agree 100%. This change was needed several years ago when companies started to use exempt workers to fill the roles from all those having hours cut and to perform the jobs at the last minute due to corporate visitors or just because. I have worked 13 hour days 6 days a week for the past few years for no reason, other than I was voluntold to do so because corporate needed to make payroll and we sent everyone else home. But we “forgot” that customers don’t care about payroll and someone still has to take care of them. You should be proud…Only doubling? What happened to incremental steps? All this will do is raise prices (again) and provide more taxes for the government. I work with small businesses in small town USA and this is a nightmare for them. We need people in government who are driven to serve all businesses and employees alike (and not by their political agendas and deep pockets) to coming up with more reasonable “regulation minimums”. I work with small companies in a town where the government (Public Debt – Ironic?) cannibalizes the local workforce be offering unbelievable pay, benefits and time-off. They leave small businesses to work there and leave the leftover employees and businesses to deal with outcome of staff shortages and higher prices. Government needs to stay out of the way and let the free market drive employee retention. They need to start listening to the people! my assistant will have to perform those task? also me and my asst. is on salary. so how would i be exempt from OT if i have to perform job duties of those employees that were sent home. plus working over 55 hours a week. Wow it’s amazing how many people say they don’t like this. I think the companies may have brainwashed you. Regardless of what companies end up doing, you’ll earn more. For all those who say just get another job that pays more, and that this rule will hurt employees, does it hurt you to make what you’re currently making, instead of half that? Probably not! Companies have brainwashed people into thinking what’s good for them is good for their workers, and vice versa. For companies who say they’d be out of business if they had to hire someone, chances are the business doesn’t have the market presence to exist in the first place, and you’re just giving viable businesses a reason to pay less. good job! I have been studying and researching the Fair Labor Standards Act under which this falls for 15+ years. This is a good rule change for the ethical companies that appreciate and respect their workers. Unfortunately, most companies these days don’t fall under this description. I agree with the comment above about the retail market. My husband has a college degree and, at his young age of 62 (yes, this is young), he has been unable to find full-time work and this change in the law will do nothing to help him and will result in more part-timers out there. Shame on the company’s who will give the raise and then expect workers to regularly work 50+ hours a week. The intent of the law was not to give those company’s a free ride to hire and over work individuals who are so tired, they have no time or energy to help kids with homework, spend time with family members, or take care of aging parents. Yes, it is easy to say, one could quit and find another position. It’s not that easy to find full-time positions with benefits. I often work 50+ hours a week, but I am fortunate to have a very good salary and excellent benefits. I work for an organization that honors its core values! Two of which are respect and community! Too many managers do not realize when you treat your workers well, it will result in less turnover and a savings to the company! I’m hoping some companies will get the message! My company works little overtime with white collar Associates. No one will get more money from this new rule, now everyone with have to clock in and out to ensure compliance with the new rules. Thank you Democrats for taking away our liberty to come and go at work. How are commissioned sale people affected by the new OT rules when their base is significantly below the new cutoff but with commissions would normally be above the cutoff? I’m a salary non exempt manufacturing worker, my employer pays us straight time for hours over 40. Most of us fall below the new rate, will this new rate/ law affect us? Seeing as through we’re non exempt. After 26 years with the same company, my base pay is 57K / year. What does this mean to us in the middle. I live in the state of Kansas which is an “employment at will” state. Can my employer fire me to evade paying me the difference? I work 60 hours a week with a $600 a week salary. How is this new rule going to affect me? IT still doesn’t do enough! When you are hired on as Salary your pay is still based on 40 hours a week unless you agreed to be on a 50 hour work week or XXXX. I am a professional Salary person that was hired in at 40 hours a week. I get forced to work overtime quite a bit and if I don’t like it then use the door and go some place else. I like what i do except when forced to work the extra time. The OT laws should be based on ANYBODY that is required to work above 40 hours to be paid for that time NO Exception. About 10 years ago I did get paid time and a half and double time, by the law. I didn’t get USED and ABUSED then. Now I get forced to work that time frame and now miss my family time at times. It still ISN’T enough it should be back to ANYBODY that is Salary if you work above your approved agreed on work week hours then it should be paid the OT. A Puerto Rico también se le aplicaría esta norma o quedo liberada de ella?. Puerto Rico will take part of this? I’m currently on salary in NC for $45,000 a year, I work anywhere from 40 to 50 hours each week. Does this mean my salary should be increased to $47,476 a year? I live in a “right to work” state…can my employer fire me to avoid paying the higher wages??? Included Puerto Rico? When is effective that directrices? I manage up to 15 people at a time. I hire and fire people. I work in a call center that supports computers and software. I work 40 to 50 hours a week. I have not seen no salary increase and nothing has been said at work about this. My last yearly review I was told I was over paid worker and needed to be working more hours and doing more then my peers. I worked for this company for 11 years. So $40,000 a year is top pay with this company. I read what qualifies for the standard amount required with out paying over time. Is there a deadline that the company has to comply with to get everyone there raises? Does this OT rule apply to Immigrant Farm Workers on a temporary VISA? I’ve always wondered why someone who feels like he’s being overworked can’t just find another job. The more the government takes over responsibility for our own actions (such as choosing a different job), the more freedoms we lose collectively as citizens. Besides that, business owners are normally smart enough to find ways to negate whatever benefit is intended with this law as they, justifiably, focus on their bottom lines. For companies who can afford it, automating the process of workforce management to deal with this new law makes it at least stomachable. SwipeClock (http://www.swipeclock.com) is on that has integrated compliance with this new law into is employee time and attendance system. I worked as a retail manager for over 11 years that used and abused salaried exempt employees because they had to cut payroll by cutting hours for hourly employees. That doesn’t mean the customers stop coming and someone has to restock the shelves. So you end up working 6 or 7 days a week to make up payroll for the company to make profit goals. You work 12-13 hour days. Which would be fine if you received any extra compensation for it. But I don’t see how you can look at this situation in any other way than a company taking advantage just because they don’t have to pay you more. And like someone else said, why wouldn’t you just quit, after you’ve given 11 years of your life to a place and you’re making $43,000 a year, it’s hard to give that up and go work somewhere else. What I still fear will happen is that the abuse will just get worse for those of us that make above the threshold for overtime benefits and they’ll just stop asking those making less to work the extra hours and force the extra work on those of us making more. I am a business owner who has about 40 employees…..the thing that I find interesting is the program does not take into account an American…….who might actually want to INVEST in themselves……what are we telling our kids about this country when the are going to be trained (brainwashed) into thinking about 40 hours………WOW………40 hours ……….that is now the new mindset………not the land of opportunity……not ….INVEST. IN YOUR FUTURE…….Every individual has a choice to to INVEST IN THEMSELVES…..seems to me that this just took lots of choices away from lots of people……how does a young PERSON get ahead……oh …by limiting the investment in themselves to 40 hours per week….VALUE =VALUE……..you cannot ACCOMPLISH ANYTHING IN THIS LIFE WITHOUT INVESTING IN IT………ANYTHING…….FAMILIES……CAREERS……..ANYTHING……..Small and medium sized businesses in this country get lumped in with the “large greedy corporations”……. for anyone that cares to look close enough……there are lots of damn good caring people……. who want to see other people live great lives and do all in their power to create and support the OPPORTUNITIES IN THIS COUNTRY…….i want to thank the govt for forgetting that his is the land of opportunity and now is the land of “the opportunity you can create in under 40 hours”……..this “rule” ……in a “Free” country………does not make me feel very free………. 153. National Railroad Adjustment Board. 155. Functions of Mediation Board. 156. Procedure in changing rates of pay, rules, and working conditions. 158. Agreement to arbitrate; form and contents; signatures and acknowledgment; revocation. 159. Award and judgment thereon; effect of chapter on individual employee. 159a Special procedure for commuter service. (b) Request for establishment of emergency board. (d) Public hearing by National Mediation Board upon failure of emergency board to effectuate settlement of dispute. (e) Establishment of second emergency board. (f) Submission of final offers to second emergency board by parties. board. (g) Report of second emergency board. (h) Maintenance of status quo during dispute period. (i) Work stoppages by employees subsequent to carrier offer selected; eligibility of employees for benefits. (j) Work stoppages by employees subsequent to employees offer selected: eligibility of employer for benefits. 161. Effect of partial invalidity of chapter. 163. Repeal of prior legislation; exception. 181. Application of subchapter I to carriers by air. 182. Duties, penalties, benefits, and privileges of subchapter I applicable. 183. Disputes within jurisdiction of Mediation Board. 184. System, group, or regional boards of adjustment. 185. National Air Transport Adjustment Board. This chapter is referred to in sections 231, 351, 354, 355, 362, 401, 404, 431, 522, 565, 591, 726, 797k, 851, 853, 1108, 1207 of this title; title 11 section 1167; title 18 section 1951; title 26 section 3231; title 29 sections 152, 182, 401, 402, 523, 630, 1002, 1415, 2108; title 42 section 2000e; title 49 section 10722; title 49 App. section 1382. This subchapter is referred to in sections 181, 182 of this title; title 11 section 1113. First. The term “carrier” includes any railroad subject to the jurisdiction of the Surface Transportation Board, any express company that would have been subject to subtitle IV of title 49, United States Code, as of December 31, 1995, and any company which is directly or indirectly owned or controlled by or under common control with any carrier by railroad and which operates any equipment or facilities or performs any service (other than trucking service) in connection with the transportation, receipt, delivery, elevation, transfer in transit, refrigeration or icing, storage, and handling of property transported by railroad, and any receiver, trustee, Or other individual or body, judicial or otherwise, when in the possession of the business of any such “carrier”: Provided, however, That the term “carrier” shall not include any street, interurban, or suburban electric railway, unless such railway is operating as a part of a general steam-railroad system of transportation, but shall not exclude any part of the general steamrailroad system of transportation now or hereafter operated by any other motive power. The Surface Transportation Board is authorized and directed upon request of the Mediation Board or upon complaint of any party interested to determine after hearing whether any line operated by electric power falls within the terms of this proviso. The term “carrier” shall not include any company by reason of its being engaged in the mining of coal, the supplying of coal to a carrier where delivery is not beyond the mine tipple, and the operation of equipment or facilities therefor, or in any of such activities. Second. The term “Adjustment Board” means the National Railroad Adjustment Board created by this chapter. Third. The term “Mediation Board” means the National Mediation Board created by this chapter. Fourth. The term “commerce” means commerce among the several States or between any State, Territory, or the District of Columbia and any foreign nation, or between any Territory or the District of Columbia and any State, or between any Territory and any other Territory, or between any Territory and the District of Columbia, or within any Territory or the District of Columbia, or between points in the same State but through any other State or any Territory or the District of Columbia or any foreign nation. Fifth. The term “employee” as used herein includes every person in the service of a carrier (subject to its continuing authority to supervise and direct the manner of rendition of his service) who performs any work defined as that of an employee or subordinate official in the orders of the Surface Transportation Board now in effect, and as the same may be amended or interpreted by orders hereafter entered by the Board pursuant to the authority which is conferred upon it to enter orders amending or interpreting such existing orders: Provided, however, That no occupational classification made by order of the Surface Transportation Board shall be construed to define the crafts according to which railway employees may be organized by their voluntary action, nor shall the jurisdiction or powers of such employee organizations be regarded as in any way limited or defined by the provisions of this chapter or by the orders of the Board. The term “employee” shall not include any individual while such individual is engaged in the physical operations consisting of the mining of coal, the preparation of coal, the handling (other than movement by rail with standard railroad locomotives) of coal not beyond the mine tipple, or the loading of coal at the tipple. Sixth. The term “representative” means any person or persons, labor union, organization, or corporation designated either by a carrier or group of carriers or by its or their employees, to act for it or them. Seventh. The term “district court” includes the United States District Court for the District of Columbia; and the term “court of appeals” includes the United States Court of Appeals for the District of Columbia. This chapter, referred to in text, was in the original “this Act”, meaning act May 20, 1926, ch. 347, 44 Stat. 577 ‘ as amended, known as the Railway Labor Act, which enacted this chapter and amended sections 225 and 348 of former Title 28, Judicial Code and Judiciary. Sections 225 and 348 of former Title 28 were repealed by section 39 of act June 25, 1948, ch. 646, 62 Stat. 992, section 1 of which enacted Title 28, Judiciary and Judicial Procedure. Section 225 of former Title 28 was reenacted as sections 1291 to 1294 of Title 28. For complete classification of this Act to the Code, see this section and Tables. In par. First, “subtitle IV of title 49” substituted for “the Interstate Commerce Act [49 U.S.C. 1 et seq. ]” on authority of Pub. L. 95-473, §3(b), Oct. 17, 1978, 92 Stat. 1466, the first section of which enacted subtitle IV of Title 49, Transportation. Provisions of act Aug. 13, 1940, §2, similar to those comprising par. First of this section, limiting the term “employer” as applied to mining, etc., of coal, were formerly contained in section 228a of this title. Provisions of section 3 of the act, similar to those comprising par. Fifth of this section, limiting the term “employee” as applied to mining, etc., of coal, were formerly contained in sections 228a, 261, and 351 of this title, and section 1532 of former Title 26, Internal Revenue Code, 1939. As originally enacted, par. Seventh contained references to the Supreme Court of the District of Columbia. Act June 25, 1936 substituted “the district court of the United States for the District of Columbia” for “the Supreme Court of the District of Columbia”, and act June 25, 1948, as amended by act May 24, 1949, substituted “United States District Court for the District of Columbia” for “district court of the United States for the District of Columbia”. As originally enacted, par. Seventh contained references to the “circuit court of appeals”. Act June 25, 1948, as amended by act May 24, 1949, substituted “court of appeals” for “circuit court of appeals”. As originally enacted, par. Seventh contained references to the “Court of Appeals of the District of Columbia”. Act June 7, 1934, substituted “United States Court of Appeals for the District of Columbia” for “Court of Appeals of the District of Columbia”. 1940-Act Aug. 13, 1940, inserted last sentence of par. First, and second par. of par. Fifth. 1934-Act June 21, 1934, added par. Sixth and redesignated provisions formerly set out as par. Sixth as Seventh. This section is referred to in sections 157, 182 of this title. The purposes of the chapter are: (1) To avoid any interruption to commerce or to the operation of any carrier engaged therein; (2) to forbid any limitation upon freedom of association among employees or any denial, as a condition of employment or otherwise, of the right of employees to join a labor organization; (3) to provide for the complete independence of carriers and of employees in the matter of self-organization to carry out the purposes of this chapter-, (4) to provide for the prompt and orderly settlement of all disputes concerning rates of pay, rules, or working conditions; (5) to provide for the prompt and orderly settlement of all disputes growing out of grievances or out of the interpretation or application of agreements covering rates of pay, rules, or working conditions. 1934-Act June 21, 1934, reenacted provisions comprising this section without change. This section is referred to in sections 153, 157 of this title. It shall be the duty of all carriers, their officers, agents, and employees to exert every reasonable effort to make and maintain agreements concerning rates of pay, rules, and working conditions, and to settle all disputes, whether arising out of the application of such agreements or otherwise, in order to avoid any interruption to commerce or to the operation of any carrier growing out of any dispute between the carrier and the employees thereof. All disputes between a carrier or carriers and its or their employees shall be considered, and, if possible, decided, with all expedition, in conference between representatives designated and authorized so to confer, respectively, by the carrier or carriers and by the employees thereof interested in the dispute. Representatives, for the purposes of this chapter, shall be designated by the respective parties without interference, influence, or coercion by either party over the designation of representatives by . the other; and neither party shall in any way interfere with, influence, or coerce the other in its choice of representatives. Representatives of employees for the purposes of this chapter need not be persons in the employ of the carrier, and no carrier shall, by interference, influence, or coercion seek in any manner to prevent the designation by its employees as their representatives of those who or which are not employees of the carrier. Employees shall have the right to organize and bargain collectively through representatives of their own choosing. The majority of any craft or class of employees shall have the right to determine who shall be the representative of the craft or class for the purposes of this chapter. No carrier, its officers, or agents shall deny or in any way question the right of its employees to join, organize, or assist in organizing the labor organization of their choice, and it shall be unlawful for any carrier to interfere in any way with the organization of its employees, or to use the funds of the carrier in maintaining or assisting or contributing to any labor organizabion, labor representative, or other agency of collective bargaining, or in performing any work therefor, or to influence or coerce employees in an effort to induce them to join or remain or not to join or remain members of any labor organization, or to deduct from the wages of employees any dues, fees, assessments, or other contributions payable to labor organizations, or to collect or to assist in the collection of any such dues, fees, assessments, or other contributions: Provided, That nothing in this chapter shall be construed to prohibit a carrier from permitting an employee, individually, or local representatives of employees from conferring with management during working hours without loss of time, or to prohibit a carrier from furnishing free transportation to its employees while engaged in the business of a labor organization. No carrier, its officers, or agents shall require any person seeking employment to sign any contract or agreement promising to join or not to join a labor organization; and if any such contract has been enforced prior to the effective date of this chapter, then such carrier shall notify the employees by an appropriate order that such contract has been discarded and is no longer binding on them in any way. In case of a dispute between a carrier or carriers and its or their employees, arising out of grievances or out of the interpretation or application of agreements concerning rates of pay, rules, or working conditions, it shall be the duty of the designated representative or representatives of such carrier or carriers and of such employees, within ten days after the receipt of notice of a desire on the part of either party to confer in respect to such dispute, to specify a time and place at which such conference shall be held: Provided, (1) That the place so specified shall be situated upon the line of the carrier involved or as otherwise mutually agreed upon; and (2) that the time so specified shall allow the designated conferees reasonable opportunity to reach such place of conference, but shall not exceed twenty days from the receipt of such notice: And provided further, That nothing in this chapter shall be construed to supersede the provisions of any agreement (as to conferences) then in effect between the parties. No carrier, its officers, or agents shall change the rates of pay, rules, or working conditions of its employees, as a class, as embodied in agreements except in the manner prescribed in such agreements or in section 156 of this title. Every carrier shall notify its employees by printed notices in such form and posted at such times and places as shall be specified by the Mediation Board that all disputes between the carrier and its employees will be handled in accordance with the requirements of this chapter, and in such notices there shall be printed verbatim, in large type, the third, fourth, and fifth paragraphs of this section. The provisions of said paragraphs are made a part of the contract of employment between the carrier and each employee, and shall be held binding upon the parties, regardless of any other express or implied agreements between them. If any dispute shall arise among a carrier’s employees as to who are the representatives of such employees designated and authorized in accordance with the requirements of this chapter, it shall be the duty of the Mediation Board, upon request of either party to the dispute, to investigate such dispute and to certify to both parties, in writing, within thirty days after the receipt of the invocation of its services, the name or names of the individuals or organizations that have been designated and authorized to represent the employees involved in the dispute, and certify the same to the carrier. Upon receipt of such certification the carrier shall treat with the representative so certified as the representative of the craft or class for the purposes of this chapter. In such an investigation, the Mediation Board shall be authorized to take a secret ballot of the employees involved, or to utilize any other appropriate method of ascertaining the names of their duly designated and authorized representatives in such manner as shall insure the choice of representatives by the employees without interference, influence, or coercion exercised by the carrier. In the conduct of any election for the purposes herein indicated the Board shall designate who may participate in the election and establish the rules to govern the election, or may appoint a committee of three neutral persons who after hearing shall within ten days designate the employees who may participate in the election. The Board shall have access to and have power to make copies of the books and records of the carriers to obtain and utilize such information as may be deemed necessary by it to carry out the purposes and provisions of this paragraph. The willful failure or refusal of any carrier, its officers or agents, to comply with the terms of the third, fourth, fifth, seventh, or eighth paragraph of this section shall be a misdemeanor, and upon conviction thereof the carrier, officer, or agent offending shall be subject to a fine of not less than $1,000, nor more than $20,000, or imprisonment for not more than six months, or both fine and imprisonment, for each offense, and each day during which such carrier, officer, or agent shall willfully fail or refuse to comply with the terms of the said paragraphs of this section shall constitute a separate offense. It shall be the duty of any United States attorney to whom any duly designated representative of a carrier’s employees may apply to institute in the proper court and to prosecute under the direction of the Attorney General of the United States, all necessary proceedings for the enforcement of the provisions of this section, and for the punishment of all violations thereof and the costs and expenses of such prosecution shall be paid out of the appropriation for the expenses of the courts of the United States: Provided, That nothing in this chapter shall be construed to require an individual employee to render labor or service without his consent, nor shall anything in this chapter be construed to make the quitting of his labor by an individual employee an illegal act; nor shall any court issue any process to compel the performance by an individual employee of such labor or service, without his consent. Notwithstanding any other provisions of this chapter, or of any other statute or law of the United States, or Territory thereof, or of any State, any carrier or carriers as defined in this chapter and a labor organization or labor organizations duly designated and authorized to represent employees in accordance with the requirements of this chapter shall be permitted(a) to make agreements, requiring, as a condition of continued employment, that within sixty days following the beginning of such employment, or the effective date of such agreements, whichever is the later, all employees shall become members of the labor organization representing their craft or class: Provided, That no such agreement shall require such condition of employment with respect to employees to whom membership is not available upon the same terms and conditions as are generally applicable to any other member or with respect to employees to whom membership was denied or terminated for any reason other than the failure of the employee to tender the periodic dues, initiation fees, and as sessments (not including fines and penalties) uniformly required as a condition of acquiring or retaining membership. (b) to make agreements providing for the deduction by such carrier or carriers from the wages of its or their employees in a craft or class and payment to the labor organization representing the craft or class of such employees, of any periodic dues, initiation fees, and assessments (not including fines and penalties) uniformly required as a condition of acquiring or retaining membership: Provided, That no such agreement shall be effective with respect to any individual employee until he shall have furnished the employer with a written assignment to the labor organization of such membership dues, initiation fees, and assessments, which shall be revocable in writing after the expiration of one year or upon the termination date of the applicable collective agreement, whichever occurs sooner. (c) The requirement of membership in a labor organization in an agreement made pursuant to subparagraph (a) of this paragraph shall be satisfied, as to both a present or future employee in engine, train, yard, or hostling service, that is, an employee engaged in any of the services or capacities covered in the First division of paragraph (h) of section 153 of this title defining the jurisdictional scope of the First Division of the National Railroad Adjustment Board, if said emplovee shall hold or acquire membership in any one of the labor organizations, national in scope, organized in accordance with this chapter and admitting to membership employees of a craft or class in any of said services; and no agreement made pursuant to subparagraph (b) of this paragraph shall provide for deductions from his wages for periodic dues, initiation fees, or assessments payable to any labor organization other than that in which he holds membership: Provided, however, That as to an employee in any of said services on a particular carrier at the effective date of any such agreement on a carrier, who is not a member of any one of the labor organizations, national in scope, organized in accordance with this chapter and admitting to membership employees of a craft or class in any of said services, such employee, as a condition of continuing his employment, may be required to become a member of the organization representing the craft in which he is employed on the effective date of the first agreement applicable to him: Provided, further, That nothing herein or in any such agreement or agreements shall prevent an employee from changing membership from one organization to another organization admitting to membership employees of a craft or class in any of said services. (d) Any provisions in paragraphs Fourth and Fifth of this section in conflict herewith are to the extent of such conflict amended. The effective date of this chapter, referred to in par. Fifth, probably means May 20, 1926, the date of approval of act May 20, 1926, ch. 347, 44 Stat. 577. 1951-Act Jan. 10, 1951, added par. Eleventh. 1934-Act June 21, 1934, substituted “by the carrier or carriers” for “by the carriers” in par. Second, generally amended pars. Third, Fourth, and Fifth, and added pars. Sixth to Tenth. Act June 25, 1948, eff. Sept. 1, 1948, substituted “United States attorney” for “district attorney of the United States”. See section 541 of Title 28, Judiciary and Judicial Procedure, and Historical and Revision Notes thereunder. This section is referred to in sections 153, 157 of this title; title 29 section 2101. There is established a Board, to be known as the “National Railroad Adjustment Board”, the members of which shall be selected within thirty days after June 21, 1934, and it is provided(a) That the said Adjustment Board shall consist of thirty-four members, seventeen of whom shall be selected by the carriers and seventeen by such labor organizations of the employees, national in scope, as have been or may be organized in accordance with the provisions of sections 151a and 152 of this title. (b) The carriers, acting each through its board of directors or its receiver or receivers, trustee or trustees, or through an officer or officers designated for that purpose by such board, trustee or trustees, or receiver or receivers, shall prescribe the rules under which its representatives shall be selected and shall select the representatives of the carriers on the Adjustment Board and designate the division on which each such representative shall serve, but no carrier or system of carriers shall have more than one voting representative on any division of the Board. (c) Except as provided in the second paragraph of subsection (h) of this section, the national labor organizations, as defined in paragraph (a) of this section, acting each through the chief executive or other medium designated by the organization or association thereof, shall prescribe the rules under which the labor members of the Adjustment Board shall be selected and shall select such members and designate the division on which each member shall serve; but no labor organization shall have more than one voting representative on any division of the Board. (d) In case of a permanent or temporary vacancy on the Adjustment Board, the vacancy shall be filled by selection in the same manner as in the original selection. (e) If either the carriers or the labor organizations of the employees fail to select and designate representatives to the Adjustment Board, as provided in paragraphs (b) and (c) of this section, respectively, within sixty days after June 21, 1934, in case of any original appointment to office of a member of the Adjustment Board, or in case of a vacancy in any such office within thirty days after such vacancy occurs, the Mediation Board shall thereupon directly make the appointment and shall select an individual associated in interest with the carriers or the group of labor organizations of employees, whichever he is to represent. (f) In the event a dispute arises as to the right of any national labor organization to participate as per paragraph (c) of this section in the selection and designation of the labor members of the Adjustment Board, the Secretary of Labor shall investigate the claim of such labor organization to participate, and if such claim in the judgment of the Secretary of Labor has merit, the Secretary shall notify the Mediation Board accordingly, and within ten days after receipt of such advice the Mediation Board shall request those national labor organizations duly qualified as per paragraph (c) of this section to participate in the selection and designation of the labor members of the Adjustment Board to select a representative. Such representative, together with a representative likewise designated by the claimant, and a third or neutral party designated by the Mediation Board, constituting a board of three, shall within thirty days after the appointment of the neutral member, investigate the claims of the labor organization desiring participation and decide whether or not it was organized in accordance with sections 151a and 152 of this title and is otherwise properly qualified to participate in the selection of the labor members of the Adjustment Board, and the findings of such boards of three shall be final and binding. (g) Each member of the Adjustment Board shall be compensated by the party or parties he is to represent. Each third or neutral party selected under the provisions of paragraph (f) of this section shall receive from the Mediation Board such compensation as the Mediation Board may fix, together with his necessary traveling expenses and expenses actually incurred for subsistence, or per them allowance in lieu thereof, subject to the provisions of law applicable thereto, while serving as such third or neutral party. First division: To have jurisdiction over disputes involving train- and yard-service employees of carriers; that is, engineers, firemen, hostlers, and outside hostler helpers, conductors, trainmen, and yard-service employees. This division shall consist of eight members, four of whom shall be selected and designated by the carriers and four of whom shall be selected and designated by the labor organizations, national in scope and organized in accordance with sections 151a and 152 of this title and which represent employees in engine, train, yard, or hostling service: Provided, however, That each labor organization shall select and designate two members on the First Division and that no labor organization shall have more than one vote in any proceedings of the First Division or in the adoption of any award with respect to any dispute submitted to the First Division: Provided further, however, That the carrier members of the First Division shall cast no more than two votes in any proceedings of the division or in the adoption of any award with respect to any dispute submitted to the First Division. Second division: To have jurisdiction over disputes involving machinists, boilermakers, blacksmiths, sheet-metal workers, electrical workers, carmen, the helpers and apprentices of all the foregoing, coach cleaners, power-house employees, and railroad-shop laborers. This division shall consist of ten members, five of whom shall be selected by the carriers and five by the national labor organizations of the employees. Third division: To have jurisdiction over disputes involving station, tower, and telegraph employees, train dispatchers, maintenance-of-way men, clerical employees, freight handlers, express, station, and store employees, signal men, sleeping-car conductors, sleeping-car porters, and maids and dining-car employees. This Division shall consist of ten members, five of whom shall be selected by the carriers and five by the national labor organizations of employees. Fourth division: To have jurisdiction over disputes involving employees of carriers directly or indirectly engaged in transportation of passengers or property by water, and all other employees of carriers over which jurisdiction is not given to the first, second, and third divisions. This division shall consist of six members, three of whom shall be selected by the carriers and three by the national labor organizations of the employees. (i) The disputes between an employee or group of employees and a carrier or carriers growing out of grievances or out of the interpretation or application of agreements concerning rates of pay, rules, or working conditions, including -cases pending and unadjusted on June 21, 1934, shall be handled in the usual manner up to and including the chief operating officer of the carrier designated to handle such disputes; but, failing to reach an adjustment in this manner, the disputes may be referred by petition of the parties or by either party to the appropriate division of the Adjustment Board with a full statement of the facts and all supporting data bearing upon the disputes. (j) Parties may be heard either in person, by counsel, or by other representatives, as they may respectively elect, and the several divisions of the Adjustment Board shall give due notice of all hearings to the employee or employees and the carrier or carriers involved in any disputes submitted to them. (k) Any division of the Adjustment Board shall have authority to empower two or more of its members to conduct hearings and make findings upon disputes, when properly submitted, at any place designated by the division: Provided, however, That except as provided in paragraph (h) of this section, final awards as to any such dispute must be made by the entire division as hereinafter provided. (l) Upon failure of any division to agree upon an award because of a deadlock or inability to secure a majority vote of the division members, as provided in paragraph (n) of this section, then such division shall forthwith agree upon and select a neutral person, to be known as “referee”, to sit with the division as a member thereof, and make an award. Should the division fail to agree upon and select a referee within ten days of the date of the deadlock or inability to secure a majority vote, then the division, or any member thereof, or the parties or either party to the dispute may certify that fact to the Mediation Board, which Board shall, within ten days from the date of receiving such certificate, select and name the referee to sit with the division as a member thereof and make an award. The Mediation Board shall be bound by the same provisions in the appointment of these neutral referees as are provided elsewhere in this chapter for the appointment of arbitrators and shall fix and pay the compensation of such referees. (m) The awards of the several divisions of the Adjustment Board shall be stated in writing. A copy of the awards shall be furnished to the respective parties to the controversy, and the awards shall be final and binding upon both parties to the dispute. In case a dispute arises involving an interpretation of the award, the division of the board upon request of either party shall interpret the award in the light of the dispute. (n) A majority vote of all members of the division of the Adjustment Board eligible to vote shall be competent to make an award with respect to any dispute submitted to it. (o) In case of an award by any division of the Adjustment Board in favor of petitioner, the division of the Board shall make an order, directed to the carrier, to make the award effective and, if the award includes a requirement for the payment of money, to pay to the employee the sum to which he is entitled under the award on or before a day named. In the event any division determines that an award favorable to the petitioner should not be made in any dispute referred to it, the division shall make an order to the petitioner stating such determination. (p) If a carrier does not comply with an order of a division of the Adjustment Board within the time limit in such order, the petitioner, or any person for whose benefit such order was made, may file in the District Court of the United States for the district in which he resides or in which is located the principal operating office of the carrier, or through which the carrier operates, a petition setting forth briefly the causes for which he claims relief, and the order of the division of the Adjustment Board in the premises. Such suit in the District Court of the United States shall proceed in all respects as other civil suits, except that on the trial of such suit the findings and order of the division of the Adjustment Board shall be conclusive on the parties, and except that the petitioner shall not be liable for costs in the district court nor for costs at any subsequent stage of the proceedings, unless they accrue upon his appeal, and such costs shall be paid out of the appropriation for the expenses of the courts of the United States. If the petitioner shall finally prevail he shall be allowed a reasonable attorney’s fee, to be taxed and collected as a part of the costs of the suit. The district courts are empowered, under the rules of the court governing actions at law, to make such order and enter such judgment, by writ of mandamus or otherwise, as may be appropriate to enforce or set aside the order of the division of the Adjustment Board: Provided, however, That such order may not be set aside except for failure of the division to comply with the requirements of this chapter, for failure of the order to conform, or confine itself, to matters within the scope of the division’s jurisdiction, or for fraud or corruption by a member of the division making the order. (q) If any employee or group of employees, or any carrier, is aggrieved by the failure of any division of the Adjustment Board to make an award in a dispute referred to it, or is aggrieved by any of the terms of an award or by the failure of the division to include certain terms in such award, then such employee or group of employees or carrier may file in any United States district court in which a petition under paragraph (p) could be filed, a petition for review of the division’s order. A copy of the petition shall be forthwith transmitted by the clerk of the court to the Adjustment Board. The Adjustment Board shall file in the court the record of the proceedings on which it based its action. The court shall have jurisdiction to affirm the order of the division, or to set it aside, in whole or in part, or it may remand the proceedings to the division for such further action as it may direct. On such review, the findings and order of the division shall be conclusive on the parties, except that the order of the division may be set aside, in whole or in part, or remanded to the division, for failure of the division to comply with the requirements of this chapter, for failure of the order to conform, or confine itself, to matters within the scope of the division’s jurisdiction, or for fraud or corruption by a member of the division making the order. The judgment of the court shall be subject to review as provided in sections 1291 and 1254 of title 28. (r) All actions at law based upon the provisions of this section shall be begun within two years from the time the cause of action accrues under the award of the division of the Adjustment Board, and not after. (s) The several divisions of the Adjustment Board shall maintain headquarters in Chicago, Illinois, meet regularly, and continue in session so long as there is pending before the division any matter within its jurisdiction which has been submitted for its Consideration and which has not been disposed of. (t) Whenever practicable, the several divisions or subdivisions of the Adjustment Board shall be supplied with suitable quarters in any Federal building located at its place of meeting. (u) The Adjustment Board may, subject to the approval of the Mediation Board, employ and fix the compensations of such assistants as it deems necessary in carrying on its proceedings. The compensation of such employees shall be paid by the Mediation Board. (v) The Adjustment Board shall meet within forty days after June 21, 1934, and adopt such rules as it deems necessary to control proceedings before the respective divisions and not in conflict with the provisions of this section. Immediately following the meeting of the entire Board and the adoption of such rules, the respective divisions shall meet and organize by the selection of a chairman, a vice chairman, and a secretary. Thereafter each division shall annually designate one of its members to act as chairman and one of its members to act as vice chairman: Provided, however, That the chairmanship and vice-chairmanship of any division shall alternate as between the groups, so that both the chairmanship and vice-chairmanship shall be held alternately by a representative of the carriers and a representative of the employees. In case of a vacancy, such vacancy shall be filled for the unexpired term by the selection of a successor from the same group. (w) Each division of the Adjustment Board shall annually prepare and submit a report of its activities to the Mediation Board, and the substance of such report shall be included in the annual report of the Mediation Board to the Congress of the United States. The reports of each division of the Adjustment Board and the annual report of the Mediation Board shall state in detail all cases heard, all actions taken, the names, salaries, and duties of all agencies, employees, and officers receiving compensation from the United States under the authority of this chapter, and an account of all moneys appropriated by Congress pursuant to the authority conferred by this chapter and disbursed by such agencies, employees, and officers. (x) Any division of the Adjustment Board shall have authority, in its discretion, to establish regional adjustment boards to act in its place and stead for such limited period as such division may determine to be necessary. Carrier members of such regional boards shall be designated in keeping with rules devised for this purpose by the carrier members of the Adjustment Board and the labor members shall be designated in keeping with rules devised for this purpose by the labor members of the Adjustment Board. Any such regional board shall, during the time for which it is appointed, have the same authority to conduct hearings, make findings upon disputes and adopt the same procedure as the division of the Adjustment Board appointing it, and its decisions shall be enforceable to the same extent and under the same processes. A neutral person, as referee, shall be appointed for service in connection with any such regional adjustment board in the same circumstances and manner as provided in paragraph (1) of this section, with respect to a division of the Adjustment Board. Nothing in this section shall be construed to prevent any individual carrier, system, or group of carriers and any class or classes of its or their employees, all acting through their representatives, selected in accordance with the provisions of this chapter, from mutually agreeing to the establishment of system, group, or regional boards of adjustment for the purpose of adjusting and deciding disputes of the character specified in this section. In the event that either party to such a system, group, or regional board of adjustment is dissatisfied with such arrangement, it may upon ninety days’ notice to the other party elect to come under the jurisdiction of the Adjustment Board. If written request is made upon any individual carrier by the representative of any craft or class of employees of such carrier for the establishment of a special board of adjustment to resolve disputes otherwise referable to the Adjustment Board, or any dispute which has been pending before the Adjustment Board for twelve months from the date the dispute (claim) is received by the Board, or if any carrier makes such a request upon any such representative, the carrier or the representative upon whom such request is made shall join in an agreement establishing such a board within thirty days from the date such request is made. The cases which may be considered by such board shall be defined in the agreement establishing it. Such board shall consist of one person designated by the carrier and one person designated by the representative of the employees. If such carrier or such representative fails to agree upon the establishment of such a board as provided herein, or to exercise its rights to designate a member of the board, the carrier or representative making the request for the establishment of the special board may request the Mediation Board to designate a member of the special board on behalf of the carrier or representative upon whom such request was made. Upon receipt of a request for such designation the Mediation Board shall promptly make such designation and shall select an individual associated in interest with the carrier or representative he is to represent, who, with the member appointed by the carrier or representative requesting the establishment of the special board, shall constitute the board. Each member of the board shall be compensated by the party he is to represent. The members of the board so designated shall determine all matters not previously agreed upon by the carrier and the representative of the employees with respect to the establishment and jurisdiction of the board. If they are unable to agree such matters shall be determined by a neutral member of the board selected or appointed and compensated in the same manner as is hereinafter provided with respect to situations where the members of the board are unable to agree upon an award. Such neutral member shall cease to be a member of the board when he has determined such matters. If with respect to any dispute or group of disputes the members of the board designated by the carrier and the representative are unable to agree upon an award disposing of the dispute or group of disputes they shall by mutual agreement select a neutral person to be a member of the board for the consideration and disposition of such dispute or group of disputes. In the event the members of the board designated by the parties are unable, within ten days after their failure to agree upon an award, to agree upon the selection of such neutral person, either member of the board may request the Mediation Board to appoint such neutral person and upon receipt of such request the Mediation Board shall promptly make such appointment. The neutral person so selected or appointed shall be compensated and reimbursed for expenses by the Mediation Board. Any two members of the board shall be competent to render an award. Such awards shall be final and binding upon both parties to the dispute and if in favor of the petitioner, shall direct the other party to comply therewith on or before the day named. Compliance with such awards shall be enforcible by proceedings in the United States district courts in the same manner and subject to the same provisions that apply to proceedings for enforcement of compliance with awards of the Adjustment Board. 1970-Par. First, (a). Pub. L. 91-234, § 1, substituted “thirty-four members, seventeen of whom shall be selected by the carriers and seventeen” for “thirty-six members, eighteen of whom shall be selected by the carriers arid eighteen”. Par. First, (b). Pub. L. 91-234, §2, provided that no carrier or system of carriers have more than one voting representative on any division of the National Railroad Adjustment Board. Par. First, (c). Pub. L. 91-234, §3, inserted “Except as provided in the second paragraph of subsection (h) of this section” before “the national labor organizations”, and provided that no labor organization have more than one voting representative on any division of the National Railroad Adjustment Board. Par. First, (h). Pub. L. 91-234, § 4, decreased number of members on First division of Board from ten to eight members, with an accompanying decrease of five to four as number of members of such Board elected respectively by the carriers and by the national labor organizations satisfying the enumerated requirements, and set forth provisos which limited voting by each labor organization or carrier member in any proceedings of the division or in adoption of any award. Par. First, (k). Pub. L. 91-234, §5, inserted “except as provided in paragraph (h) of this section” after proviso. Par. First, (n). Pub. L. 91-234, §6, inserted “eligible to vote” after “Adjustment Board”. 1966–Par. First, (m). Pub. L. 89-456, §2(a), struck out except insofar as they shall contain a money award” from second sentence. Par. First, (o). Pub. L. 89-456, §2(b), inserted provision for a division to make an order to the petitioner stating that an award favorable to the petitioner should not be made in any dispute referred to it. Par. First, (p). Pub. L. 89-456, §2(c), (d), substituted in second sentence “conclusive on the parties” for “prima facie evidence of the facts therein stated” and inserted in last sentence reasons for setting aside orders of a division of the Adjustment Board, respectively. Par. First, (q) to (x). Pub. L. 89-456, §2(e), added par. (q) and redesignated former pars. (q) to (w) as (r) to (x), respectively. Par. Second. Pub. L. 89-456, §1, provided for establishment of special adjustment boards upon request of employees or carriers to resolve disputes otherwise referable to the Adjustment Board and made awards of such boards final. 1934-Act June 21, 1934, amended provisions comprising this section generally. Costs, see rule 54 and notes of Advisory Committee under the Rule, Title 28, Appendix, Judiciary and Judicial Procedure. Federal Rules of Civil Procedure as governing the procedure in all suits of a civil nature whether cognizable as cases at law or in equity, see rule 1. Mandamus as abolished but relief yet available by appropriate action or motion under Federal Rules of Civil Procedure, see rule 81 and Notes of Advisory Committee under the rule. One form of action, see rule 2. Pleadings allowed, see rule 7. This section is referred to in sections 154, 157, 181, 182, 184, 185, 441, 588, 797c, 797h, 797m of this title. The Board of Mediation is abolished, effective thirty days from June 21, 1934, and the members, secretary, officers, assistants, employees, and agents thereof, in office upon June 21, 1934, shall continue to function and receive their salaries for a period of thirty days from such date in the same manner as though this chapter had not been passed. There is established, as an independent agency in the executive branch of the Government, a board to be known as the “National Mediation Board”, to be composed of three members appointed by the President, by and with the advice and consent of the Senate, not more than two of whom shall be of the same political party. Each member of the Mediation Board in office on January 1, 1965, shall be deemed to have been appointed for a term of office which shall expire on July 1 of the year his term would have otherwise expired. The terms of office of all successors shall expire three years after the expiration of the terms for which their predecessors were appointed; but any member appointed to fill a vacancy occurring prior to the expiration of the term for which his predecessor was appointed shall be appointed only for the unexpired term of his predecessor. Vacancies in the Board shall not impair the powers nor affect the duties of the Board nor of the remaining members of the Board. Two of the members in office shall constitute a quorum for the transaction of the business of the Board. Each member of the Board shall receive necessary traveling and subsistence expenses, or per them allowance in lieu thereof, subject to the provisions of law applicable thereto, while away from the principal office of the Board on business required by this chapter. No person in the employment of or who is pecuniarily or otherwise interested in any organization of employees or any carrier shall enter upon the duties of or continue to be a member of the Board. Upon the expiration of his term of office a member shall continue to serve until his successor is appointed and shall have qualified. All cases referred to the Board of Mediation and unsettled on June 21, 1934, shall be handled to conclusion by the Mediation Board. A member of the Board may be removed by the President for inefficiency, neglect of duty, malfeasance in office, or ineligibility, but for, no other cause. The Mediation Board shall annually designate a member to act as chairman. The Board shall maintain its principal office in the District of Columbia, but it may meet at any other place whenever it deems it necessary so to do. The Board may designate one or more of its members to exercise the functions of the Board in mediation proceedings. Each member of the Board shall have power to administer oaths and affirmations. The Board shall have a seal which shall be judicially noticed. The Board shall make an annual report to Congress. The Mediation Board may (1) subject to the provisions of the civil service laws, appoint such experts and assistants to act in a confidential capacity and such other officers and employees as are essential to the effective transaction of the work of the Board; (2) in accordance with chapter 51 and subchapter III of chapter 53 of title 5, fix the salaries of such experts, assistants, officers, and employees; and (3) make such expenditures (including expenditures for rent and personal services at the seat of government and elsewhere, for law books, periodicals, and books of reference, and for printing and binding, and including expenditures for salaries and compensation, necessary traveling expenses and expenses actually incurred for subsistence, and other necessary expenses of the Mediation Board, Adjustment Board, Regional Adjustment Boards established under paragraph (w) of section 153 of this title, and boards of arbitration, in accordance with the provisions of this section and sections 153 and 157 of this title, respectively), as may be necessary for the execution of the functions vested in the Board, in the Adjustment Board and in the boards of arbitration, and as may be provided for by the Congress from time to time. All expenditures of the Board shall be allowed and paid on the presentation of itemized vouchers therefor approved by the chairman. The Mediation Board is authorized by its order to assign, or refer, any portion of its work, business, or functions arising under this chapter or any other Act of Congress, or referred to it by Congress or either branch thereof, to an individual member of the Board or to an employee or employees of the Board to be designated by such order for action thereon, and by its order at any time to amend, modify, supplement, or rescind any such assignment or reference. All such orders shall take effect forthwith and remain in effect until otherwise ordered by the Board. In conformity with and subject to the order or orders of the Mediation Board in the premises, [and] such individual member of the Board or employee designated shall have power and authority to act as to any of said work, business, or functions so assigned or referred to him for action by the Board. All officers and employees of the Board of Mediation (except the members thereof, whose offices are abolished) whose services in the judgment of the Mediation Board are necessary to the efficient operation of the Board are transferred to the Board, without change in classification or compensation; except that the Board may provide for the adjustment of such classification or compensation to conform to the duties to which such officers and employees may be assigned. All unexpended appropriations for the operation of the Board of Mediation that are available at the time of the abolition of the Board of Mediation shall be transferred to the Mediation Board and shall be available for its use for salaries and other authorized expenditures. The civil service laws, referred to in par. Third, are set forth in Title 5, Government Organization and Employees. See, particularly, section 3301 et seq. of Title 5. In par. First, provisions that prescribed the basis compensation of members of the Board were omitted to conform to the provisions of the Executive Schedule. See sections 5314 and 5315 of Title 5, Government Organization and Employees. In par. Third, “subject to the provisions of the civil service laws, appoint such experts and assistants to act in a confidential capacity and such other officers and employees” substituted for “appoint such experts and assistants to act in a confidential capacity and, subject to the provisions of the civil-service laws, such other officers and employees”. All such appointments are now subject to the civil service laws unless specifically excepted by such laws or by laws enacted subsequent to Executive Order 8743, Apr. 23, 1941, issued by the President pursuant to the Act of Nov. 26, 1940, ch. 919, title I, §1, 54 Stat. 1211, which covered most excepted positions into the classified (competitive) civil service. The Order is set out as a note under section 3301 of Title 5. In par. Third, “chapter 51 and subchapter III of chapter 53 of title 5” substituted for “the Classification Act of 1949, as amended” on authority of Pub. L. 89-554, §7(b), Sept. 6, 1966, 80 Stat. 631, the first section of which enacted Title 5. 1964-Par. First. Pub. L. 88-542 inserted sentences proIliding that each member of the Board in office on Jan. 1, 1965, shall be deemed to have been appointed for a term of office which shall expire on July 1 of the year his term would have otherwise expired, and that upon the expiration of his term of office a member shall continue to serve until his successor is appointed and shall have qualified, and struck out provisions which related to terms of office of members first appointed. 1949-Par. First. Act Oct. 15, 1949, increased basic rate f compensation for members of the board to $15,000 per 0 year. Par. Third. Act Oct. 28, 1949, substituted “Classification Act of 194911 for “Classification Act of 1923”. 1934-Act June 21, 1934, amended section generally. Act Oct. 28, 1949, ch. 782, cited as a credit to this section, was repealed (subject to a savings clause) by Pub. L. 89-554, Sept. 6, 1966, §8, 80 Stat. 632, 655. This section is referred to in section 157 of this title. (a) A dispute concerning changes in rates of pay, rules, or working conditions not adjusted by the parties in conference. (b) Any other dispute not referable to the National Railroad Adjustment Board and not adjusted in conference between the parties or where conferences are refused. The Mediation Board may proffer its services in case any labor emergency is found by it to exist at any time. In either event the said Board shall promptly put itself in communication with the parties to such controversy, and shall use its best efforts, by mediation, to bring them to agreement. If such efforts to bring about an amicable settlement through mediation shall be unsuccessful, the said Board shall at once endeavor as its final required action (except as provided in paragraph third of this section and in section 160 of this title) to induce the parties to submit their controversy to arbitration, in accordance with the provisions of this chapter. If arbitration at the request of the Board shall be refused by one or both parties, the Board shall at once notify both parties in writing that its mediatory efforts have failed and for thirty days thereafter, unless in the intervening period the parties agree to arbitration, or an emergency board shall be created under section 160 of this title, no change shall be made in the rates of pay, rules, or working conditions or established practices in effect prior to the time the dispute arose. In any case in which a controversy arises over the meaning or the application of any agreement reached through mediation under the provisions of this chapter, either party to the said agreement, or both, may apply to the Mediation Board for an interpretation of the meaning or application of such agreement. The said Board shall upon receipt of such request notify the parties to the controversy, and after a hearing of both sides give its interpretation within thirty days. (a) On failure of the arbitrators named by the parties to agree on the remaining arbitrator or arbitrators within the time set by section 157 of this title, it shall be the duty of the Mediation Board to name such remaining arbitrator or arbitrators. It shall be the duty of the Board in naming such arbitrator or arbitrators to appoint only those whom the Board shall deem wholly disinterested in the controversy to be arbitrated and impartial and without bias as between the parties to such arbitration. Should, however, the Board name an arbitrator or arbitrators not so disinterested and impartial, then, upon proper investigation and presentation of the facts, the Board shall promptly remove such arbitrator. If an arbitrator named by the Mediation Board, in accordance with the provisions of this chapter, shall be removed by such Board as provided by this chapter, or if such an arbitrator refuses or is unable to serve, it shall be the duty of the Mediation Board, promptly, to select another arbitrator, in the same manner as provided in this chapter for an original appointment by the Mediation Board. (b) Any member of the Mediation Board is authorized to take the acknowledgment of an agreement to arbitrate under this chapter. When so acknowledged, or when acknowledged by the parties before a notary public or the clerk of a district court or a court of appeals of the United States, such agreement to arbitrate shall be delivered to a member of said Board or transmitted to said Board, to be filed in its office. (c) When an agreement to arbitrate has been filed with the Mediation Board, or with one of its members, as provided by this section, and when the said Board has been furnished the names of the arbitrators chosen by the parties to the controversy it shall be the duty of the Board to cause a notice in writing to be served upon said arbitrators, notifying them of their appointment, requesting them to meet promptly to name the remaining arbitrator or arbitrators necessary to complete the Board of Arbitration, and advising them of the period within which, as provided by the agreement to arbitrate, they are empowered to name such arbitrator or arbitrators. (d) Either party to an arbitration desiring the reconvening of a board of arbitration to pass upon any controversy arising over the meaning or application of an award may so notify the Mediation Board in writing, stating in such notice the question or questions to be submitted to such reconvened Board. The Mediation Board shall thereupon promptly communicate with the members of the Board of Arbitration, or a subcommittee of such Board appointed for such purpose pursuant to a provision in the agreement to arbitrate, and arrange for the reconvening of said Board of Arbitration or subcommittee, and shall notify the respective parties to the controversy of the time and place at which the Board, or the subcommittee, will meet for hearings upon the matters in controversy to be submitted to it. No evidence other than that contained in the record filed with the original award shall be received or considered by such reconvened Board or subcommittee, except such evidence as may be necessary to illustrate the interpretations suggested by the parties. If any member of the original Board is unable or unwilling to serve on such reconvened Board or subcommittee thereof, another arbitrator shall be named in the same manner and with the same powers and duties as such original arbitrator. (e) Within sixty days after June 21, 1934, every carrier shall file with the Mediation Board a copy of each contract with its employees in effect on the lst day of April 1934, covering rates of pay, rules, and working conditions. If no contract with any craft or class of its employees has been entered into, the carrier shall file with the Mediation Board a statement of that fact, including also a statement of the rates of pay, rules, and working conditions applicable in dealing with such craft or class. When any new contract is executed or change is made in an existing contract with any class or craft of its employees covering rates of pay, rules, or working conditions, or in those rates of pay, rules, and working conditions of employees not covered by contract, the carrier shall file the same with the Mediation Board within thirty days after such new contract or change in existing contract has been executed or rates of pay, rules, and working conditions have been made effective. (f) The Mediation Board shall be the custodian of all papers and documents heretofore filed with or transferred to the Board of Mediation bearing upon the settlement, adjustment, or determination of disputes between carriers and their employees or upon mediation or arbitration proceedings held under or pursuant to the provisions of any Act of Congress in respect thereto; and the President is authorized to designate a custodian of the records and property of the Board of Mediation until the transfer and delivery of such records to the Mediation Board and to require the transfer and delivery to the Mediation Board of any and all such papers and documents filed with it or in its possession. As originally enacted, par. Third (b) contained a reference to the “circuit court of appeals”. Act June 25, 1948, as amended by act May 24, 1949 substituted “court of appeals” for “circuit court of appeals”. 1934-Act June 21, 1934, amended generally par. First and par. Second, (e) and (f). This section is referred to in sections 156, 157, 183 of this title. Carriers and representatives of the employees shall give at least thirty days’ written notice of an intended change in agreements affecting rates of pay, rules, or working conditions, and the time and place for the beginning of conference between the representatives of the parties interested in such intended changes shall be agreed upon within ten days after the receipt of said notice, and said time shall be within the thirty days provided in the notice. In every case where such notice of intended change has been given, or conferences are being held with reference thereto, or the services of the Mediation Board have been requested by either party, or said Board has proffered its services, rates of pay, rules, or working conditions shall not be altered by the carrier until the controversy has been finally acted upon, as required by section 155 of this title, by the Mediation Board, unless a period of ten days has elapsed after termination of conferences without request for or proffer of the services of the Mediation Board. Ex. Ord. No. 9299, eff. Feb. 4, 1943, 8 F.R. 1669, provided procedure with respect to wage and salary adjustments for employees subject to this chapter. This section is referred to in sections 152, 157, 726, 741, 797g, 1346 of this title; title 11 section 1167. Whenever a controversy shall arise between a carrier or carriers and its or their employees which is not settled either in conference betweeri representatives of the parties or by the appropriate adjustment board or through mediation, in the manner provided in sections 151156 of this title such controversy may, by agreement of the parties to such controversy, be submitted to the arbitration of a board of three (or, if the parties to the controversy so stipulate, of six) persons: Provided, however, That the failure or refusal of either party to submit a controversy to arbitration shall not be construed as a violation of any legal obligation imposed upon such party by the terms of this chapter or otherwise. (a) In the case of a board of three the carrier or carriers and the representatives of the employees, parties respectively to the agreement to arbitrate, shall each name one arbitrator; the two arbitrators thus chosen shall select a third arbitrator. If the arbitrators chosen by the parties shall fail to name the third arbitrator within five days after their first meeting, such third arbitrator shall be named by the Mediation Board. (b) In the case of a board of six the carrier or carriers and the representatives of the employees, parties respectively to the agreement to arbitrate, shall each name two arbitrators; the four arbitrators thus chosen shall, by a majority vote, select the remaining two arbitrators. If the arbitrators chosen by the parties shall fail to name the two arbitrators within fifteen days after their first meeting, the said two arbitrators, or as many of them as have not been named, shall be named by the Mediation Board. When the arbitrators selected by the respective parties have agreed upon the remaining arbitrator or arbitrators, they shall notify the Mediation Board; and, in the event of their failure to agree upon any or upon all of the necessary arbitrators within the period fixed by this chapter, they shall, at the expiration of such period, notify the Mediation Board of the arbitrators selected, if any, or of their failure to make or to complete such selection. The board of arbitration shall organize and select its own chairman and make all necessary rules for conducting its hearings: Provided, however, That the board of arbitration shall be bound to give the parties to the controversy a full and fair hearing, which shall include an opportunity to present evidence in support of their claims, and an opportunity to present their case in person, by counsel, or by other representative as they may respectively elect. Upon notice from the Mediation Board that the parties, or either party, to an arbitration desire the reconvening of the board of arbitration (or a subcommittee of such board of arbitration appointed for such purpose pursuant to the agreement to arbitrate) to pass upon any controversy over the meaning or application of their award, the board, or its subcommittee, shall at once reconvene. No question other than, or in addition to, the questions relating to the meaning or application of the award, submitted by the party or parties in writing, shall be considered by the reconvened board of arbitration or its subcommittee. Such rulings shall be acknowledged by such board or subcommittee thereof in the same manner, and filed in the same district court clerk’s office, as the original award and become a part thereof. No arbitrator, except those chosen by the Mediation Board, shall be incompetent to act as an arbitrator because of his interest in the controversy to be arbitrated, or because of his connection with or partiality to either of the parties to the arbitration. Each member of any board of arbitration created under the provisions of this chapter named by either party to the arbitration shall be compensated by the party naming him. Each arbitrator selected by the arbitrators or named by the Mediation Board shall receive from the Mediation Board such compensation as the Mediation Board may fix, together with his necessary traveling expenses and expenses actually incurred for subsistence, while serving as an arbitrator. The board of arbitration shall furnish a certified copy of its award to the respective parties to the controversy, and shall transmit the original, together with the papers and proceedings and a transcript of the evidence taken at the hearings, certified under the hands of at least a majority of the arbitrators, to the clerk of the district court of the United States for the district wherein the controversy arose or the arbitration is entered into, to be filed in said clerk’s office as hereinafter provided. The said board shall also furnish a certified copy of its award, and the papers and proceedings, including testimony relating thereto, to the Mediation Board 0 be filed in its office; and in addition a certified copy of its award shall be filed in the office of the Interstate Commerce Commission: Provided, however, That such award shall not be construed to diminish or extinguish any of the powers or duties of the Interstate Commerce Commission, under subtitle IV of title 49. A board of arbitration may, subject to the approval of the Mediation Board, employ and fix the compensation of such assistants as it deems necessary in carrying on the arbitration proceedings. The compensation of such employees, together with their necessary traveling expenses and expenses actually incurred for subsistence, while so employed, and the necessary expenses of boards of arbitration, shall be paid by the Mediation Board. Whenever practicable, the board shall be supplied with suitable quarters in any Federal building located at its place of meeting or at any place where the board may conduct its proceedings or deliberations. All testimony before said board shall be given under oath or affirmation, and any member of the board shall have the power to administer oaths or affirmations. The board of arbitration, or any member thereof, shall have the power to require the attendance of witnesses and the production of such books, papers, contracts, agreements, and documents as may be deemed by the board of arbitration material to a just determination of the matters Submitted to its arbitration, and may for that purpose request the clerk of the district court of the United States for the district wherein said arbitration is being conducted to issue the necessary subpoenas, and upon such request the said clerk or his duly authorized deputy shall be, and he is, authorized, and it shall be his duty, to issue such subpoenas. , Any witness appearing before a board of arbiLration shall receive the same fees and mileage as witnesses in courts of the United States, to be paid by the party securing the subpoena. In par. Third (f), “subtitle IV of title 49” substituted for “the Interstate Commerce Act, as amended [49 U.S.C. 1 et seq. ]” on authority of Pub. L. 95-473, §3(b), Oct. 17, 1978, 92 Stat. 1466, the first section of which enacted subtitle IV of Title 49, Transportation. 1970-Par. Third, (h). Pub. L. 91-452 struck out provisions authorizing board to invoke aid of the United States courts to compel witnesses to attend and testify and to produce such books, papers, contracts, agreements, and documents to same extent and under same conditions and penalties as provided for in the Interstate Commerce Act. 1934-Act June 21, 1934, substituted “Mediation Board” for “Board of Mediation” wherever appearing. Amendment by Pub. L. 91-452 effective on sixtieth day following Oct. 15,1970, and not to affect any immunity to which any individual is entitled under this section by reason of any testimony given before sixtieth day following Oct. 15, 1970, see section 260 of Pub. L. 91-452, set out as an Effective Date; Savings Provisions note under section 6001 of Title 18, Crimes and Criminal Procedure. “[SEC. 1. Settlement of disputes]. That no carrier which served the notices of November 2, 1959, and no labor organizations which received such notices or served the labor organization notices of September 7, 1960, shall make any change except by agreement, or pursuant to an arbitration award as hereinafter provided, in rates of pay, rules, or working conditions encompassed by any of such notices, or engage in any strike or lockout over any dispute arising from any of such notices. Any action heretofore taken which would be prohibited by the foregoing sentence shall be forthwith rescinded and the status existing immediately prior to such action restored. “SEC. 2. [Arbitration board]. There is hereby established an arbitration board to consist of seven members. The representatives of the carrier and organization parties to the aforesaid dispute are hereby directed, respectively, within five days after the enactment hereof [Aug. 28, 19631 each to name two persons to serve as members of such arbitration board. The four members thus chosen shall select three additional members. The seven members shall then elect a chairman. If the members chosen by the parties shall fail to name one or more of the additional three members within ten days, such additional members shall be named by the President. If either party fails to name a member or members to the arbitration board within the five days provided, the President shall name such member or members in lieu of such party and shall also name the additional three members necessary to constitute a board of seven members, all within ten days after the date of enactment of this joint resolution [Aug. 28, 1963]. Notwithstanding any other provision of law, the National Mediation Board is authorized and directed: (1) to compensate the arbitrators not named by the parties at a rate not in excess of $100 for each day together with necessary travel and subsistence expenses, and (2) to provide such services and facilities as may be necessary and appropriate in carrying out the purposes of this joint resolution. “SEC. 3. [Decision of board]. Promptly upon the completion of the naming of the arbitration board the Secretary of Labor shall furnish to the board and to the parties to the dispute copies of his statement to the parties of August 2, 1963, and the papers therewith submitted to the parties, together with memorandums and such other data as the board may request setting forth the matters with respect to which the parties were in tentative agreement and the extent of disagreement with respect to matters on which the parties were not in tentative agreement. The arbitration board shall make a decision, pursuant to the procedures hereinafter set forth, as to what disposition shall be made of those portions of the carriers’ notices of November 2, 1959, identified as ‘Use of Firemen (Helpers) on Other Than Steam Power’ and ‘Consist of Road and Yard Crews’ and that portion of the organizations’ notices of September 7, 1960, identified as ‘Minimum Safe Crew Consist’ and implementing proposals pertaining thereto. The arbitration board shall incorporate in such decision any matters on which it finds the parties were in agreement, shall resolve the matters on which the parties were not in agreement, and shall, in making its award, give due consideration to those matters on which the parties were in tentative agreement. Such award shall be binding on both the carrier and organization parties to the dispute and shall constitute a complete and final disposition of the aforesaid issues covered by the decision of the board of arbitration. “SEC. 4. [Award]. To the extent not inconsistent with this joint resolution the arbitration shall be conducted pursuant to sections 7 and 8 of the Railway Labor Act [this section and section 158 of this title], the board’s award shall be made and filed as provided in said sections and shall be subject to section 9 of said Act [section 159 of this title]. The United States District Court for the District of Columbia is hereby designated as the court in which the award is to be filed, and the arbitration board shall report to the National Mediation Board in the same manner as arbitration boards functioning pursuant to the Railway Labor Act [this chapter]. The award shall continue in force for such period as the arbitration board shall determine in its award, but not to exceed two years from the date the award takes effect, unless the parties agree otherwise. “SEC. 5. [Hearings]. The arbitration board shall begin its hearings thirty days after the enactment of this joint resolution [Aug. 28, 19631 or on such earlier date as the parties to the dispute and the board may agree upon and shall make and file its award not later than ninety days after the enactment of this joint resolution [Aug. 28, 1963]: Provided, however, That said award shall not become effective until sixty days after the filing of the award. “SEC. 6. [Collective bargaining for issues not arbitrated]. The parties to the disputes arising from the aforesaid notices shall immediately resume collective bargaining with respect to all issues raised in the notices of November 2, 1959, and September 7, 1960, not to be disposed of by arbitration under section 3 of this joint resolution and shall exert every reasonable effort to resolve such issues by agreement. The Secretary of Labor and the National Mediation Board are hereby directed to give all reasonable assistance to the parties and to engage in mediatory action directed toward promoting such agreement. “(a) In making any award under this joint resolution the arbitration board established under section 2 shall give due consideration to the effect of the proposed award upon adequate and safe transportation service to the public and upon the interests of the carrier and employees affected, giving due consideration to the narrowing of the areas of disagreement which has been accomplished in bargaining and mediation. “(b) The obligations imposed by this joint resolution, upon suit by the Attorney General, shall be enforcible through such orders as may be necessary by any court of the United States having jurisdiction of any of the parties. “SEC. B. [Expiration date]. This joint resolution shall expire one hundred and eighty days after the date of its enactment (Aug. 28, 1963], except that it shall remain in effect with respect to the last sentence of section 4 for the period prescribed in that sentence. Subpoena, see rule 45, Title 28, Appendix, Judiciary and Judicial Procedure. Immunity of witnesses, see section 6001 et seq. of Title 18, Crimes and Criminal Procedure. This section is referred to in sections 154, 155, 797g Of this title; title 18 section 6001. (n) Shall provide that the respective parties to the award will each faithfully execute the same. The said agreement to arbitrate, when properly signed and acknowledged as herein provided, shall not be revoked by a party to such agreement: Provided, however, That such agreement to arbitrate may at any time be revoked and canceled by the written agreement of both parties, signed by their duly accredited representatives, and (if no board of arbitration has yet been constituted under the agreement) delivered to the Mediation Board or any member thereof; or, if the board of arbitration has been constituted as provided by this chapter, delivered to such board of arbitration. As originally enacted, par. (d) contained a reference to the “circuit court of appeals”. Act June 25, 1948, as amended by act May 24, 1949, substituted “court of appeals” for “circuit court of appeals”. The award of a board of arbitration, having been acknowledged as herein provided, shall be filed in the clerk’s office of the district court designated in the agreement to arbitrate. An award acknowledged and filed as herein provided shall be conclusive on the parties as to the merits and facts of the controversy submitted to arbitration, and unless, within ten days after the filing of the award, a petition to impeach the award, on the grounds hereinafter set forth, shall be filed in the clerk’s office of the court in which the award has been filed, the court shall enter judgment on the award, which judgment shall be final and conclusive on the parties. (c) That a member of the board of arbitration rendering the award was guilty of fraud or corruption; or that a party to the arbitration practiced fraud or corruption which fraud or corruption affected the result of the arbitration: Provided, however, That no court shall entertain any such petition on the ground that an award is invalid for uncertainty; in such case the proper remedy shall be a submission of such award to a reconvened board, or subcommittee thereof, for interpretation, as provided by this chapter: Provided further, That an award contested as herein provided shall be construed liberally by the court, with a view to favoring its validity, and that no award shall be set aside for trivial irregularity or clerical error, going only to form and not to substance. If the court shall determine that a part of the award is invalid on some ground or grounds designated in this section as a ground of invalidity, but shall determine that apart of the award is valid, the court shall set aside the entire award: Provided, however, That, if the parties shall agree thereto, and if such valid and invalid parts are separable, the court shall set aside the invalid part, and order judgment to stand as to the valid part. At the expiration of 10 days from the decision of the district court upon the petition filed as aforesaid, final judgment shall be entered in accordance with said decision, unless during said 10 days either party shall appeal therefrom to the court of appeals. In such case only such portion of the record shall be transmitted to the appellate court as is necessary to the proper understanding and consideration of the questions of law presented by said petition and to be decided. The determination of said court of appeals upon said questions shall be final, and, being certified by the clerk thereof to said district court, judgment pursuant thereto shall thereupon be entered by said district court. If the petitioner’s contentions are finally sustained, judgment shall be entered setting aside the award in whole or, if the parties so agree, in part; but in such case the parties may agree upon a judgment to be entered disposing of the subject matter of the controversy, which judgment when entered shall have the same force and effect as judgment entered upon an award. Nothing in this chapter shall be construed to require an individual employee to render labor or service without his consent, nor shall anything in this chapter be construed to make the quitting of his labor or service by an individual employee an illegal act; nor shall any court issue any process to compel the performance by an individual employee of such labor or service, without his consent. As originally enacted, pars. Fifth and Sixth contained references to the “circuit court of appeals”. Act June 25, 1948, as amended by act May 24, 1949, substituted “court of appeals” for “circuit court of appeals”. Application of rules, see rule 81, Title 28, Appendix, Judiciary and Judicial Procedure. Except as provided in section 590(h) of this title, the provisions of this section shall apply to any dispute subject to this chapter between a publicly funded and publicly operated carrier providing rail commuter service (including the Amtrak Commuter Services Corporation) and its employees. If a dispute between the parties described in subsection (a) of this section is not adjusted under the foregoing provisions of this chapter and the President does not, under section 160 of this title, create an emergency board to investigate and report on such dispute, then any party to the dispute or the Governor of any State through which the service that is the subject of the dispute is operated may request the President to establish such an emergency board. (1) Upon the request of a party or a Governor under subsection (b) of this section, the President shall create an emergency board to investigate and report on the dispute in accordance with section 160 of this title. For purposes of this subsection, the period during which no change, except by agreement, shall be made by the parties in the conditions out of which the dispute arose shall be 120 days from the day of the creation of such emergency board. (2) If the President, in his discretion, creates a board to investigate and report on a dispute between the parties described in subsection (a) of this section, the provisions of this section shall apply to the same extent as if such board had been created pursuant to paragraph (1) of this subsection. Within 60 days after the creation of an emergency board under this section, if there has been no settlement between the parties, the National Mediation Board shall conduct a public hearing on the dispute at which each party shall appear and provide testimony setting forth the reasons it has not accepted the recommendations of the emergency board for settlement of the dispute. If no settlement in the dispute is reached at the end of the 120-day period beginning on the date of the creation of the emergency board, any party to the dispute or the Governor of any State through which the service that is the subject of the dispute is operated may request the President to establish another emergency board, in which case the President shall establish such emergency board. Within 30 days after creation of a board under subsection (e) of this section, the parties to the dispute shall submit to the board final offers for settlement of the dispute. Within 30 days after the submission of final offers under subsection (f) of this section, the emergency board shall submit a report to the President setting forth its selection of the most reasonable offer. From the time a request to establish a board is made under subsection (e) of this section until 60 days after such board makes its report under subsection (g) of this section, no change, except by agreement, shall be made by the parties in the conditions out of which the dispute arose. If the emergency board selects the final offer submitted by the carrier and, after the expiration of the 60-day period described in subsection (h) of this section, the employees of such carrier engage in any work stoppage arising out of the dispute, such employees shall not be eligible during the period of such work stoppage for benefits under the Railroad Unemployment Insurance Act [45 U.S.C. 351 et seq.]. If the emergency board selects the final offer submitted by the employees and, after the expiration of the 60-day period described in subsection (h) of this section, the carrier refuses to accept the final offer submitted by the employees and the employees of such carrier engage in any work stoppage arising out of the dispute, the carrier shall not participate in any benefits of any agreement between carriers which is designed to provide benefits to such carriers during a work stoppage. The Railroad Unemployment Insurance Act, referred to in subsec. (i), is act June 25, 1938, ch. 680, 52 Stat. 1094, as amended, which is classified principally to chapter 11 (§351 et seq.) of this title. For complete classification of this Act to the Code, see section 367 of this title and Tables. Section effective Aug. 13, 1981, see section 1169 of Pub. L. 97-35, set out as a note under section 1101 of this title. If a dispute between a carrier and its employees be not adjusted under the foregoing provisions of this chapter and should, in the judgment of the Mediation Board, threaten substantially to interrupt interstate commerce to a degree such as to deprive any section of the country of essential transportation service, the Mediation Board shall notify the President, who may thereupon, in his discretion, create a board to investigate and report respecting such dispute. Such board shall be composed of such number of persons as to the President may seem desirable: Provided, however, That no member appointed shall be pecuniarily or otherwise interested in any organization of employees or any carrier. The compensation of the members of any such board shall be fixed by the President. Such board shall be created separately in each instance and it shall investigate promptly the facts as to the dispute and make a report thereon to the President within thirty days from the date of its creation. There is authorized to be appropriated such sums as may be necessary for the expenses of such board, including the compensation and the necessary traveling expenses and expenses actually incurred for subsistence, of the members of the board. All expenditures of the board shall be allowed and paid on the presentation of itemized vouchers therefor approved by the chairman. After the creation of such board and for thirty days after such board has made its report to the President, no change, except by agreement, shall be made by the parties to the controversy in the conditions out of which the dispute arose. This section is referred to in sections 155, 159a of this title. If any provision of this chapter, or the application thereof to any person or circumstance, is held invalid, the remainder of the chapter, and the application of such provision to other persons or circumstances, shall not be affected thereby. There is authorized to be appropriated such sums as may be necessary for expenditure by the Mediation Board in carrying out the provisions of this chapter. 1934-Act June 21, 1934, substituted “Mediation Board” for “Board of Mediation”. Chapters 6 and 7 of this title, providing for mediation, conciliation, and arbitration, and all Acts and parts of Acts in conflict with the provisions of this chapter are repealed, except that the members, secretary, officers, employees, and agents of the Railroad Labor Board, in office on May 20, 1926, shall receive their salaries for a period of 30 days from such date, in the same manner as though this chapter had not been passed. Chapters 6 and 7 of this title, referred to in text, were in the original references to the act of July 15, 1913, and title III of the Transportation Act, 1920, respectively. Section, act Feb. 11, 1927, ch. 104, §1, 44 Stat. 1072, related to advertisements for proposals for purchases or services rendered for Board of Mediation, including arbitration boards. See section 5 of Title 41, Public Contracts. This subchapter is referred to in title 26 section 410; title 29 section 213; title 49 App. section 1371. All of the provisions of subchapter I of this chapter except section 153 of this title are extended to and shall cover every common carrier by air engaged in interstate or foreign commerce, and every carrier by air transporting mail for or under contract with the United States Government, and every air pilot or other person who performs any work as an employee or subordinate official of such carrier or carriers, subject to its or their continuing authority to supervise and direct the manner of rendition of his service. The duties, requirements, penalties, benefits, and privileges prescribed and established by the provisions of subchapter I of this chapter except section 153 of this title shall apply to said carriers by air and their employees in the same manner and to the same extent as though such carriers and their employees were specifically included within the definition of “carrier” and “employee”, respectively, in section 151 of this title. (b) Any other dispute not referable to an adjustment board, as hereinafter provided, and not adjusted in conference between the parties, or where conferences are refused. The National Mediation Board may proffer its services in case any labor emergency is found by it to exist at any time. The services of the Mediation Board may be invoked in a case under this subchapter in the same manner and to the same extent as are the disputes covered by section 155 of this title. The disputes between an employee or group of employees and a carrier or carriers by air growing out of grievances, or out of the interpretation or application of agreements concerning rates of pay, rules, or working conditions, including cases pending and unadjusted on April 10, 1936 before the National Labor Relations Board, shall be handled in the usual manner up to and including the chief operating officer of the carrier designated to handle such disputes; but, failing to reach an adjustment in this manner, the disputes may be referred by petition of the parties or by either party to an appropriate adjustment board, as hereinafter provided, with a full statement of the facts and supporting data bearing upon the disputes. It shall be the duty of every carrier and of its employees, acting through their representatives, selected in accordance with the provisions of this subchapter, to establish a board of adjustment of jurisdiction not exceeding the jurisdiction which may be lawfully exercised by system, group, or regional boards of adjustment, under the authority of section 153 of this title. Such boards of adjustment may be established by agreement between employees and carriers either on any individual carrier, or system, or group of carriers by air and any class or classes of its or their employees; or pending the establishment of a permanent National Board of Adjustment as hereinafter provided. Nothing in this chapter shall prevent said carriers by air, or any class or classes of their employees, both acting through their representatives selected in accordance with provisions of this subchapter, from mutually agreeing to the establishment of a National Board of Adjustment of temporary duration and of similarly limited jurisdiction. When, in the judgment of the National Mediation Board, it shall be necessary to have a permanent national board of adjustment in order to provide for the prompt and orderly settlement of disputes between said carriers by air, or any of them, and its or their employees, growing out of grievances or out of the interpretation or application of agreements between said carriers by air or any of them, and any class or classes of its or their employees, covering rates of pay, rules, or working conditions, the National Mediation Board is empowered and directed, by its order duly made, published, and served, to direct the said carriers by air and such labor organizations of their employees, nationa.1 in scope, as have been or may be recognized in accordance with the provisions of this chapter, to select and designate four representatives who shall constitute a board which shall be known as the “National Air Transport Adjustment Board.” Two members of said National Air Transport Adjustment Board shall be selected by said carriers by air and two members by the said labor organizations of the employees, within thirty days after the date of the order of the National Mediation Board, in the manner and by the procedure prescribed by section 153 of this title for the selection and designation of members of the National Railroad Adjustment Board. The National Air Transport Adjustment Board shall meet within forty days after the date of the order of the National Mediation Board directing the selection and designation of its members and shall organize and adopt rules for conducting its proceedings, in the manner prescribed in section 153 of this title. Vacancies in membership or office shall be filled, members shall be appointed in case of failure of the carriers or of labor organizations of the employees to select and designate representatives, members of the National Air Transport Adjustment Board shall be compensated, hearings shall be held, findings and awards made, stated, served, and enforced, and the number and compensation of any necessary assistants shall be determined and the compensation of such employees shall be paid, all in the same manner and to the same extent as provided with reference to the National Railroad Adjustment Board by section 153 of this title. The powers and duties prescribed and established by the provisions of section 153 of this title with reference to the National Railroad Adjustment Board and the several divisions thereof are conferred upon and shall be exercised and performed in like manner and to the same extent by the said National Air Transport Adjustment Board, not exceeding, however, the jurisdiction conferred upon said National Air Transport Adjustment Board by the provisions of this subchapter. From and after the organization of the National Air Transport Adjustment Board, if any system, group, or regional board of adjustment established by any carrier or carriers by air and any class or classes of its or their employees is not satisfactory to either party thereto, the said party, upon ninety days’ notice to the other party, may elect to come under the jurisdiction of the National Air Transport Adjustment Board. Effect of rules on this section, see note by Advisory committee under rule 81. This section is referred to in title 26 section 410; title 29 section 213; title 49 section 1371. Section, act May 20, 1926, ch. 347, §206, as added Apr. 10, 1936, ch. 166, 49 Stat. 1191, transferred certain pending cases before National Labor Relations Board to Mediation Board. If any provision of this subchapter or application thereof to any person or circumstance is held invalid, the remainder of such sections and the application of such provision to other persons or circumstances shall not be affected thereby. This chapter, referred to in text, was in the original ,this Act”, meaning act May 20, 1926, ch. 347, 44 Stat. 577, as amended, known as the Railway Labor Act, which enacted this chapter and amended sections 225 and 348 of former Title 28, Judicial Code and Judiciary. Sections 225 and 348 of former Title 28 were repealed by section 39 of act June 25, 1948, ch. 646, 62 Stat. 992, section 1 of which enacted Title 28, Judiciary and Judicial ‘Procedure. Section 225 of former Title 28 was reenacted as sections 1291 to 1294 of Title 28. For complete classification of this Act to the Code, see this section and Tables. As the day went on, the parade included contingents from the Manufacturing Shoemakers Union No. 1 (wearing blue badges), and an especially well-received contingent from the “Big 6” – Typographical Union No. 6 – whose 700-strong delegation marched with military precision. (They had practiced beforehand.) The Friendly Society of Operative Masons marched with their band. They were followed by 250 members of the Clothing Cutters Benevolent and Protective Union, the Dress and Cloak Makers Union, the Decorative Masons, and the Bureau of United Carpenters (who marched with a decorated wagon). It was the first Labor Day parade – and it took place on a Tuesday. Labor Day became official in this country when the U.S. Congress passed a law in 1894 making the first Monday in September a legal holiday. But this holiday was not simply given to the workers of the United States by the government as some act of charity. The tradition of publicly honoring labor’s contribution to society is a custom established by the workers themselves. 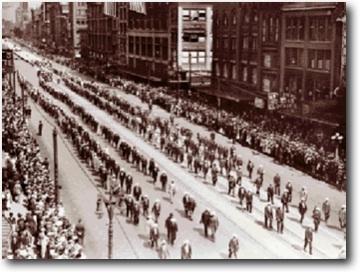 The first Labor Day parade in the United States was held in New York City on Tuesday, September 5, 1882. More than 10,000 workers marched. It was organized by the Central Labor Union, a body representing 60 unions and over 80,000 people. The CLU was a secret lodge of the Knights of Labor, the major national union of the time. To really appreciate the September 1882 labor parade, it’s important to keep in mind the profound changes that this country had gone through in the 17 years before it took place. After the Civil War ended in 1865, the capitalists of the North emerged triumphant. They went on the offensive, bitterly opposing labor’s demands. By the time the depression of 1873 took place, any lingering unity between the different forces which had united in opposition to slavery had been torn apart. The 1882 labor parade was the culmination of more than 10 years of agitating and organizing by dedicated labor activists in New York. These activists were deeply committed to the fight for the eight-hour day and against the repressive tactics of the employers. They also worked closely with the leaders of what were at that time New York’s largest immigrant communities to assist the fight for justice in three countries: Ireland, France, and Germany. Because the 1882 labor parade was held on a work day, most of the participants had to give up a day’s pay in order to march. (The CLU even levied a fine on non-participants.) In all, the workers involved forfeited about $75,000 in lost wages. 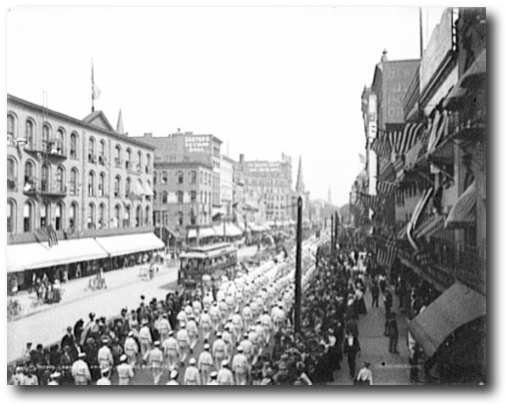 The parade was scheduled to coincide with a national conference of the Knights of Labor being held in New York. This explains why almost the entire national leadership of the Knights of Labor was present on the parade’s reviewing stand in Union Square. However, the affiliation of these leaders with the Knights of Labor was discreetly hidden from the press that day. (At the time, the Knights of Labor was still a semi-secret society.) For instance, the top leader of the Knights of Labor – “Grand Master Workman” Terence Powderly – was introduced only as the mayor of Scranton, Pennsylvania (which he was). Patrick Ford was the publisher and editor of the Irish World, a newspaper which strongly supported labor and the fight for Irish freedom. He had been brought to Boston from Ireland in 1842 at the age of seven. Ford had served his printing apprenticeship with newspaper editor William Lloyd Garrison, America’s leading opponent of slavery, before the Civil War. In 1870, Ford founded the Irish World, a newspaper which was regularly suppressed when it was shipped to Ireland. Carl Daniel Adolf Douai was the publisher and editor of the New Yorker Volkszeitung, a Socialist German-language daily. Douai was a German immigrant who had been threatened with lynching when he spoke out against slavery while publishing in Texas. In 1860, he moved to New York where he became active in Socialist, abolitionist, and Republican Party activities. The presence of these three men on the reviewing stand – and the presence of Irish, French, and German flags (in addition to the U.S. flag) at the picnic which closed the day — illustrates the wide scope of labor’s concerns at that time. These leaders’ involvement with the parade (and the militant banners carried by the marchers) show that from its very beginning, the U.S. labor movement has been about more than just getting its members a few cents more an hour in wages. From its inception, the labor movement in this country has included both native- and foreign-born leaders, and immigrant workers have always played an important role in the labor movement. From the very beginning, the U.S. labor movement has included elements who have not been afraid to challenge the legitimacy of the wages system itself. That’s definitely worth remembering this Labor Day. The article on this page was written by Chris Mahin for the Education and Mobilization Department of the Chicago & Midwest Regional Joint Board of UNITE HERE and originally appeared on the Joint Board’s website. The Affiliated System Federation appreciates the opportunity to have served you.